Posted on January 24, 2014	by Smiling Road Warriors! 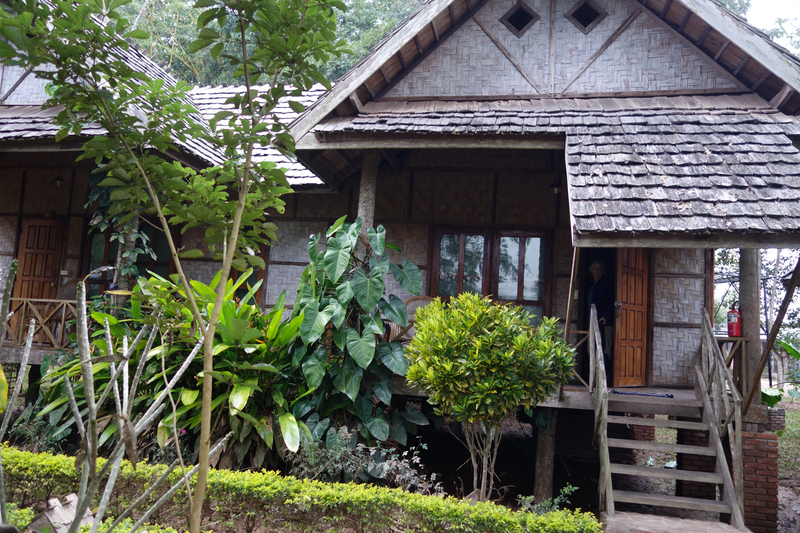 Way up North in Laos! We knew we were in for a long drive, but didn’t realize it would take ten-to-twelve hours! We found out later that we should have started at 8:00 but we had been told the night before to met our new guide at 9:00 am. Then we had to stop at 4 ATM’s on our way outta’ town before we found one that worked, which put our start even later. The ride was 308 Km (191 miles), and 85 km (52 miles) of the worst road we have EVER travelled; it took us 3 hours just on this one stretch of non-pavement. 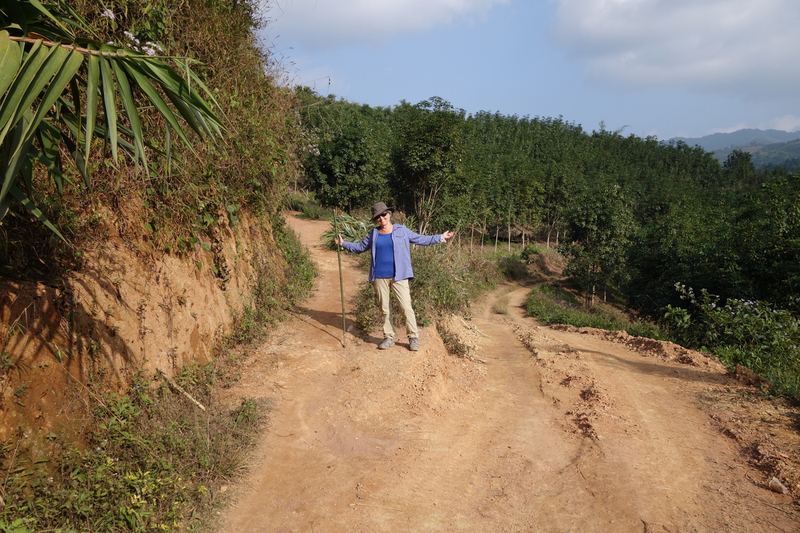 We knew it would be mountainous and curvy roads, but this road was washed out most of the way with only a small semblance of paved stretches, then just rocks and dips and potholes and ruts. We thought we would be at the Boat Landing before dark, but as it was, we drove a couple of hours into the night before arriving chilled and hungry. It was hard enough traveling in the daylight. 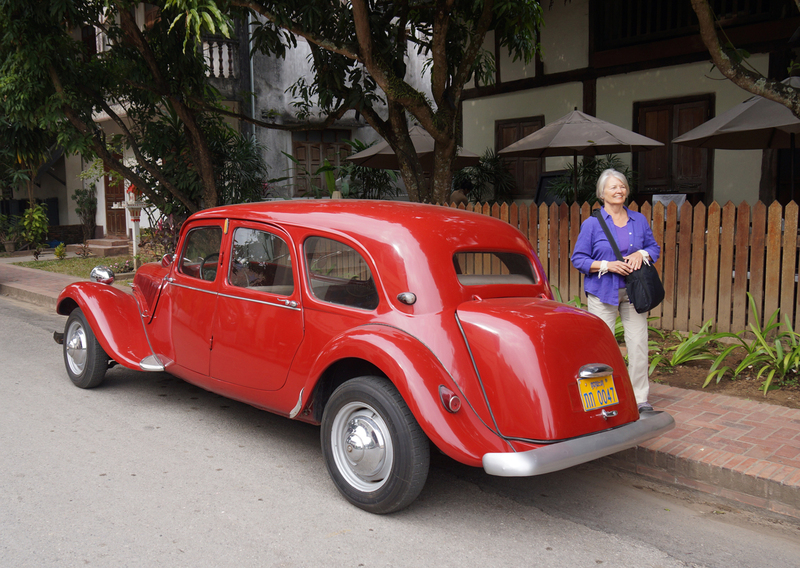 The roads are narrow and there seemed to be a hair-pin bend at virtually every corner. No wonder it took us over 10 hours to drive 191 miles. That’s about an average of 15 to 19 mph for those of you counting! 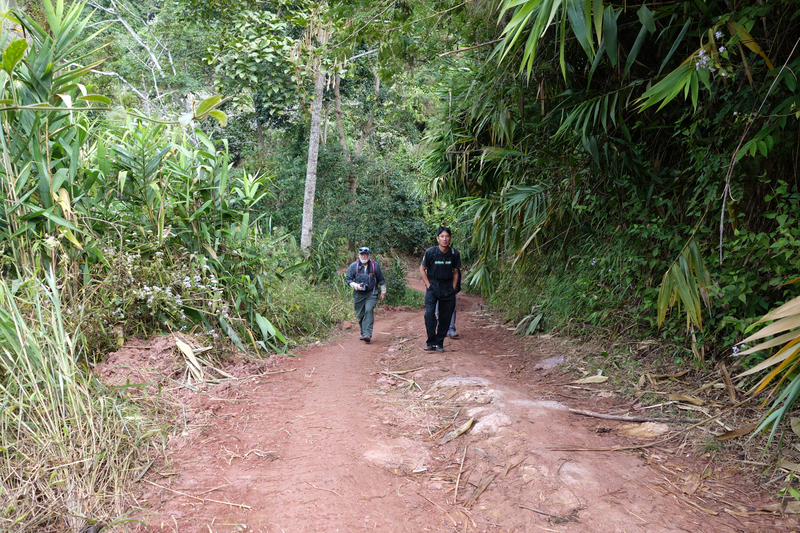 Luckily, the last 80 Km was a brand new road built by the Chinese (see my comments on the Chinese impact here in my previous post), from Oudomxai to Luang Namtha. It was full of trucks that transported food products back to China, along with the occasional manufactured goods from new Chinese factories here. We were trying to be positive and hoping the long bumpy trip would be worth it. 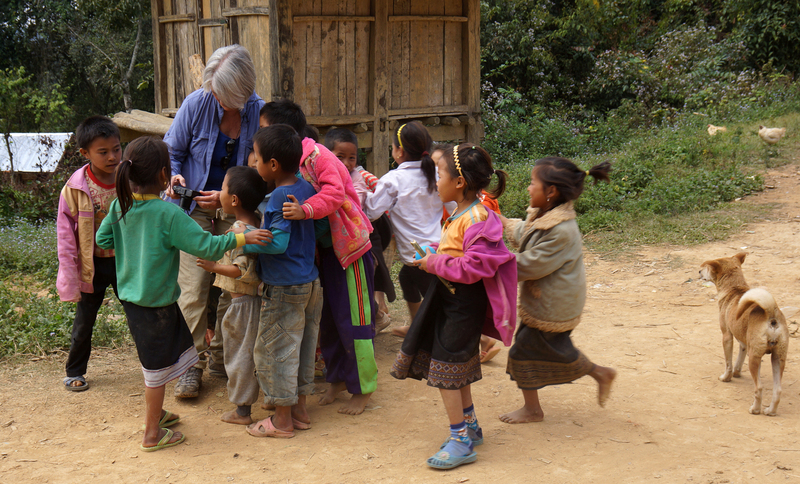 It was an experience passing through various tribal mountain villages, where we saw people taking showers on the roadside under a water pipe and children running after pigs in every direction. The villages are built right on the road. 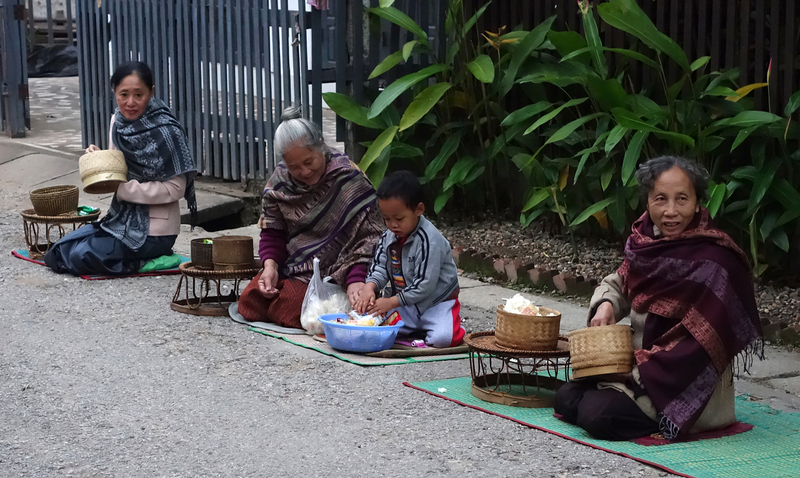 A tradition in the SE Asia countries, but not were I would want to live now, with ever more trucks, automobiles, and motorcycle traffic moving up and down these mountains. There are children playing right in or alongside the road at every turn. Scary. A variety of meats. Can you guess? 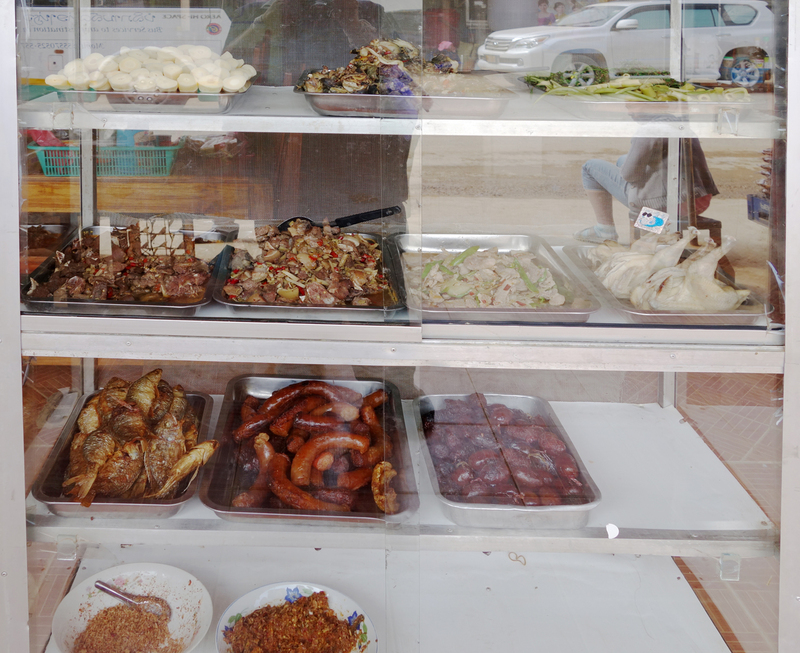 OK: some fish from the local stream, sausages of mystery-meat, small chickens, whole frog meat, fermented pork, dog meat, and we think, some fried rat . 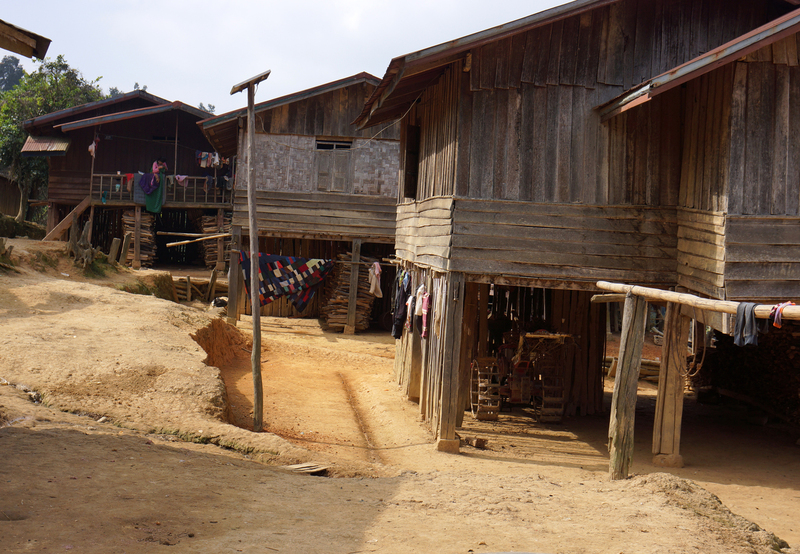 . .
We stopped at this village high up in the mountains, along the road to Oudomxai. 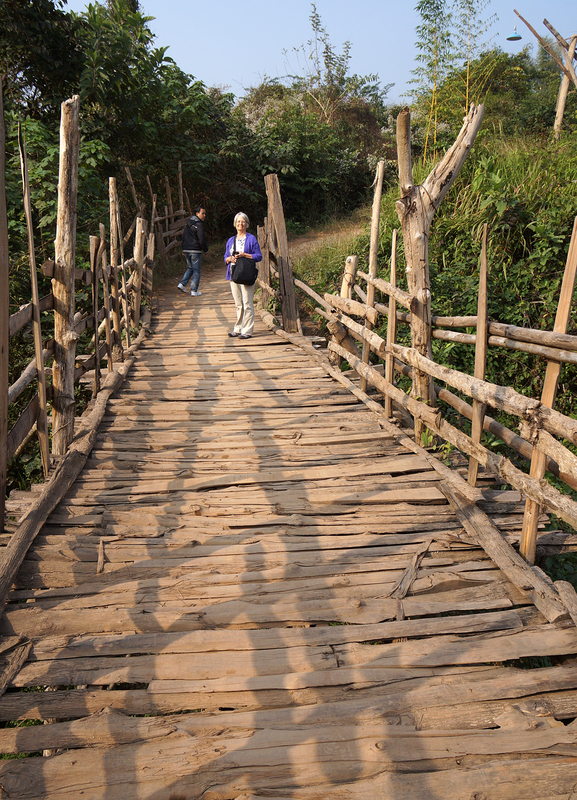 After a good dinner and night’s sleep at “The Boat Landing” , we started our trek in the Namha Valley. Resting after a long day of trekking. Nothing like a cold Beer-Lao! 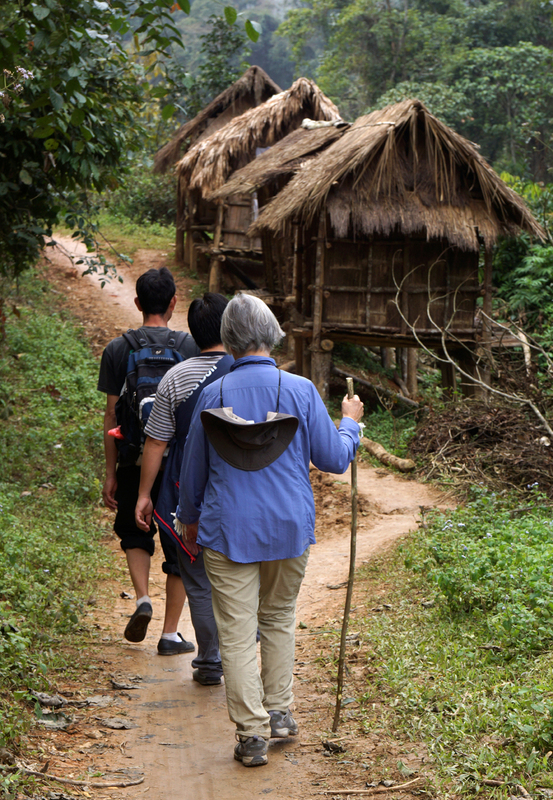 We hiked to the Ban Sida village through lush jungle, groves of rubber trees, banana trees and rice fields. 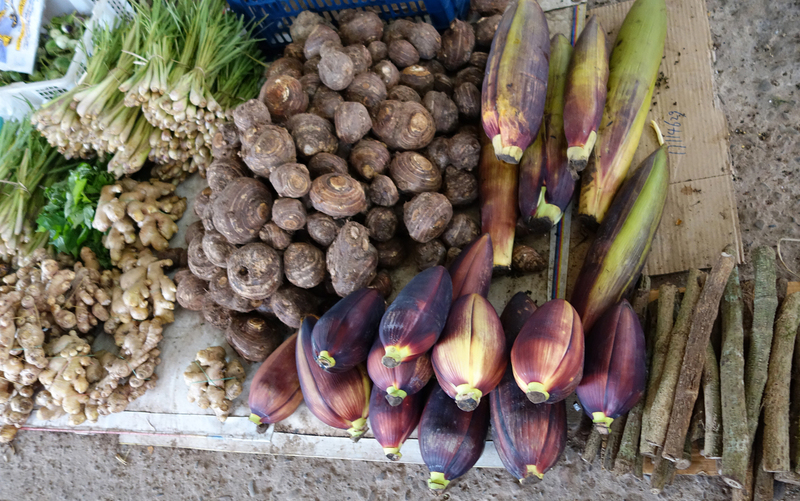 We saw so many fascinating plants — some edible and some not. 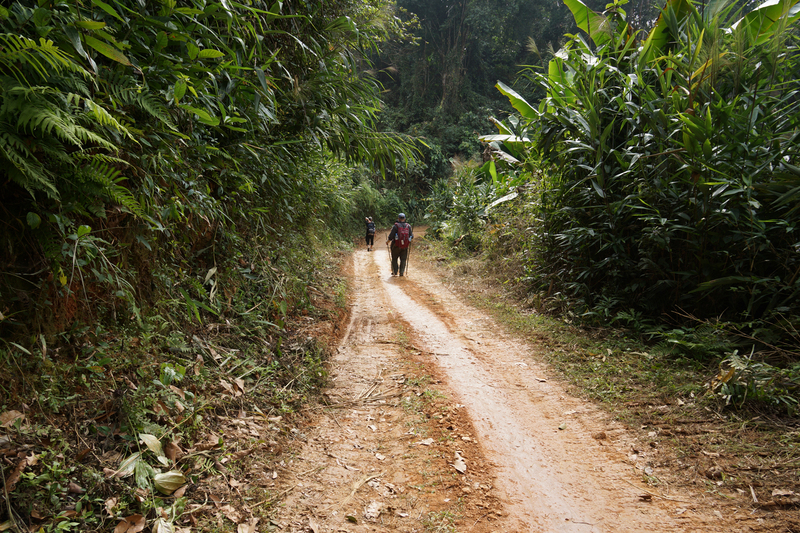 The route we took would not have been passable for us during the wet season, but at this time of year, it gave us beautiful views of the valleys below. 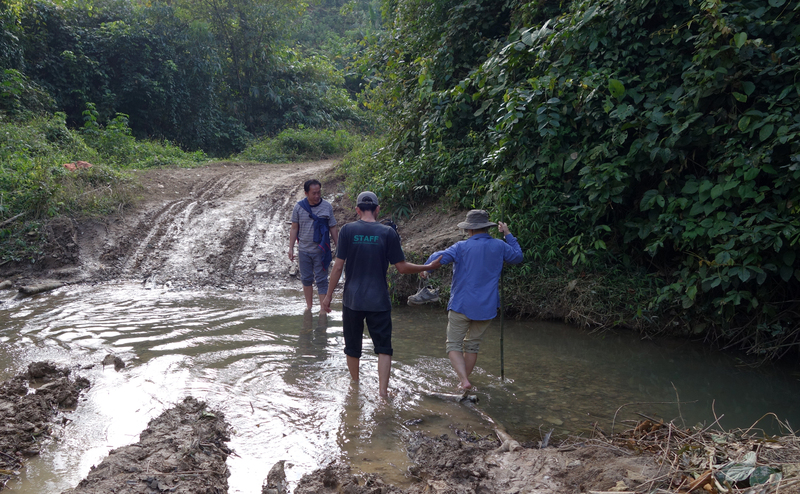 We had to cross a number of streams — taking off our shoes and wading through the cold water just added to the experience. 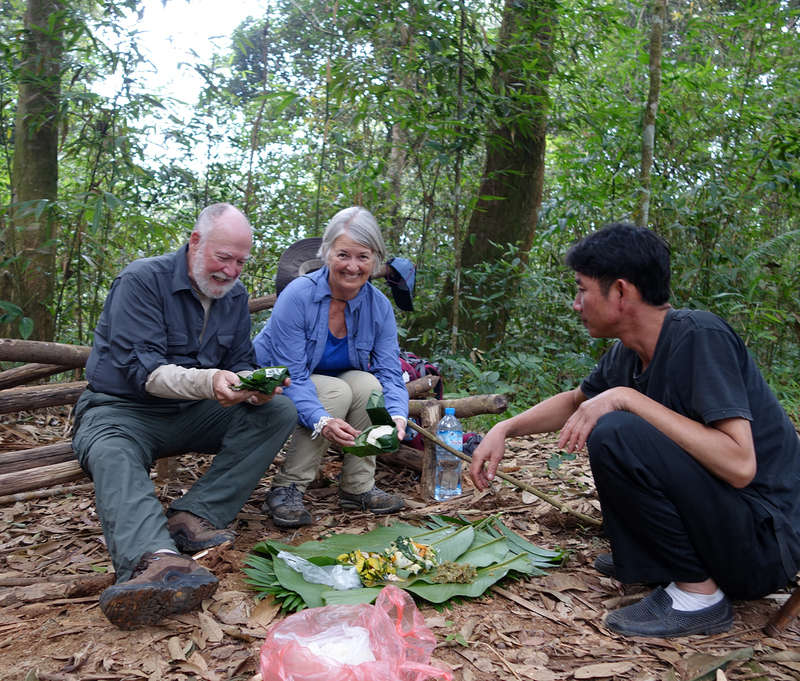 Our guide packed a delicious lunch that we ate in a clearing on the top of the mountain in a lush forest. 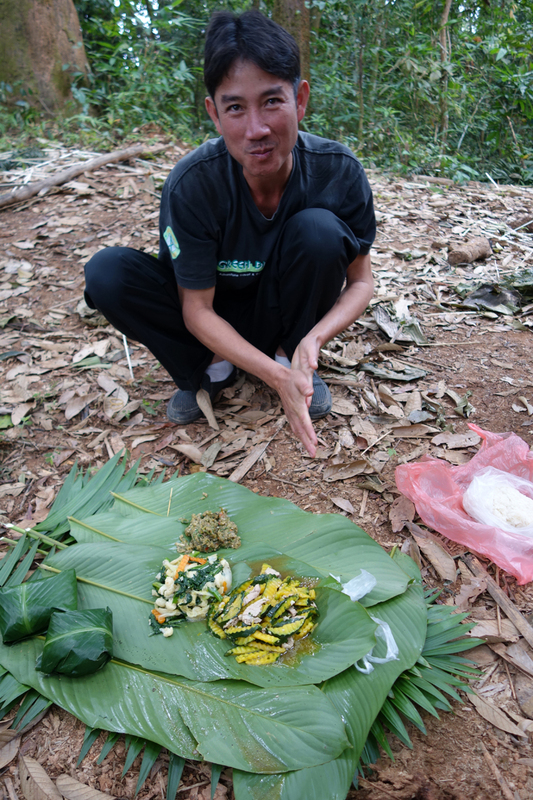 He picked some banana leaves along the way and made us an ‘elegant’ tablecloth as well as containers to hold the rice. 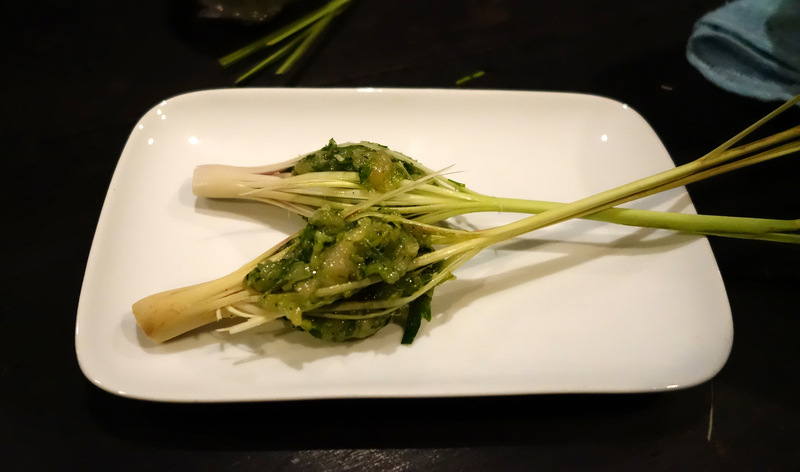 We had sticky rice, a green pumpkin dish, vegetables, and an eggplant dip. It was all delicious. 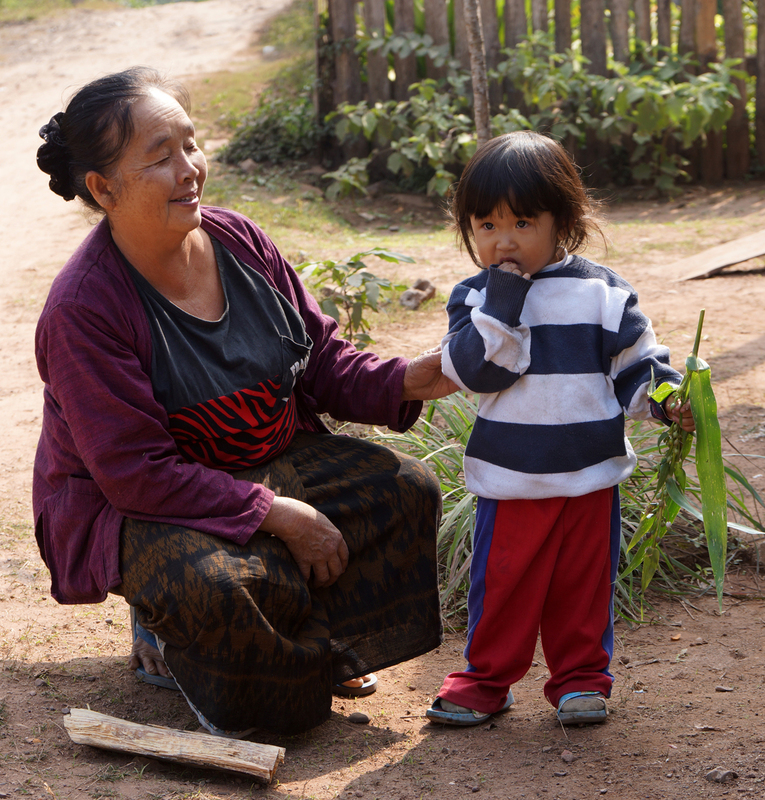 Laotians tend to eat most things with their fingers, with sticky rice as an implement to pick food up. What a concept 😊. 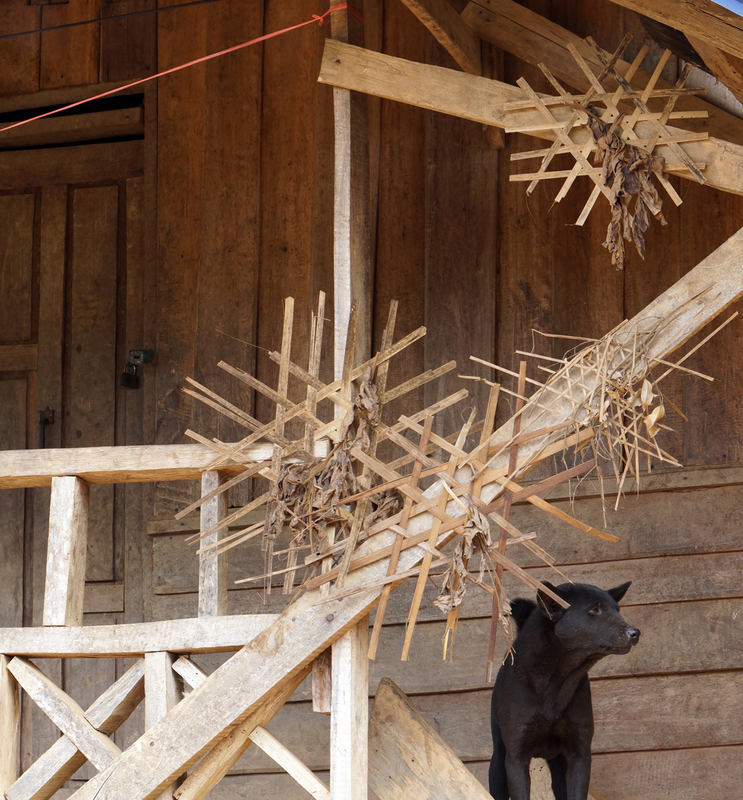 There are only two villages in Laos whose ethnic roots derive from a Tibeto-Burman group. 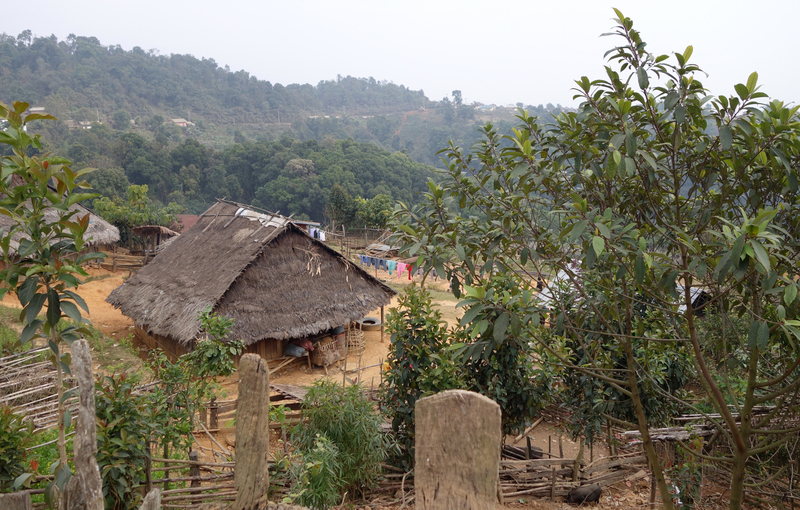 This Sida village is one of them. 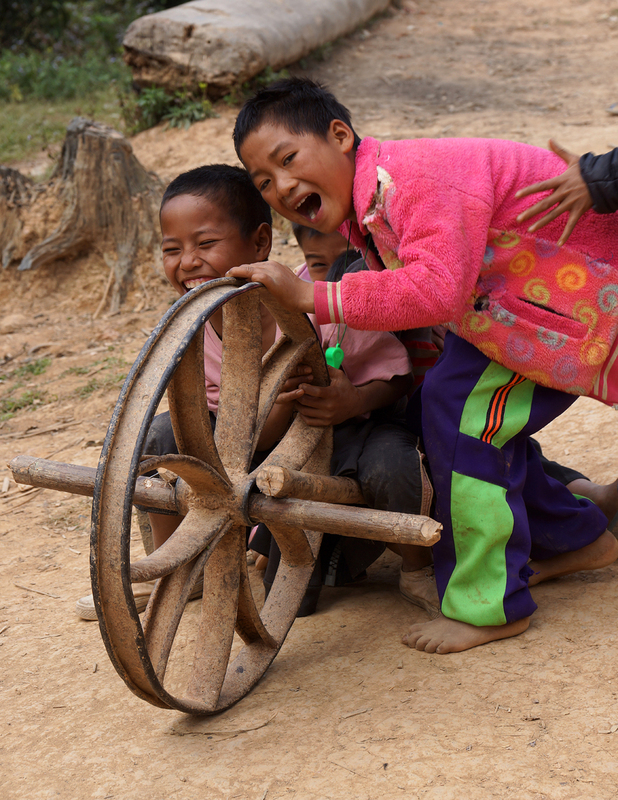 As we climbed into the village we came upon a group of young boys riding a worn-out Chinese-wheeled toy down a very steep hill, laughing all the way down. 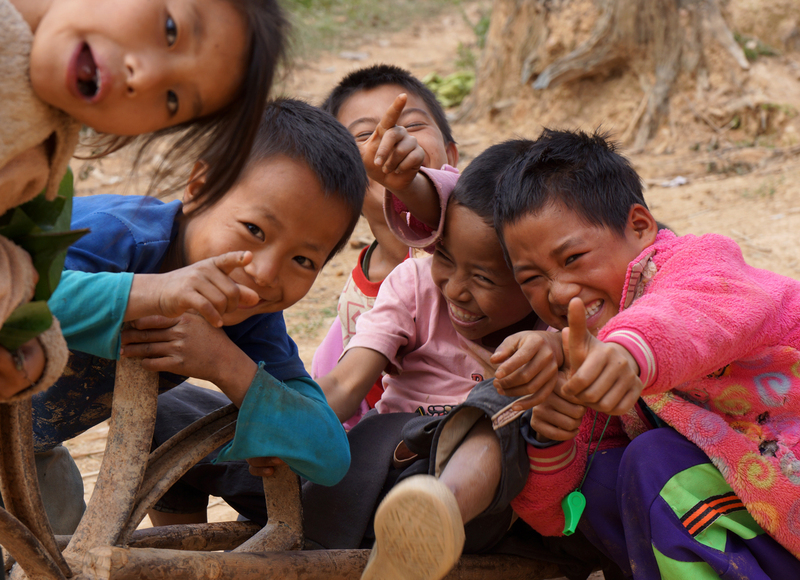 We marveled at how simple the toy, and how great the joy… When we arrived at the top of this hill we were next to a very small school, and all the kids were playing in the dirt yard. 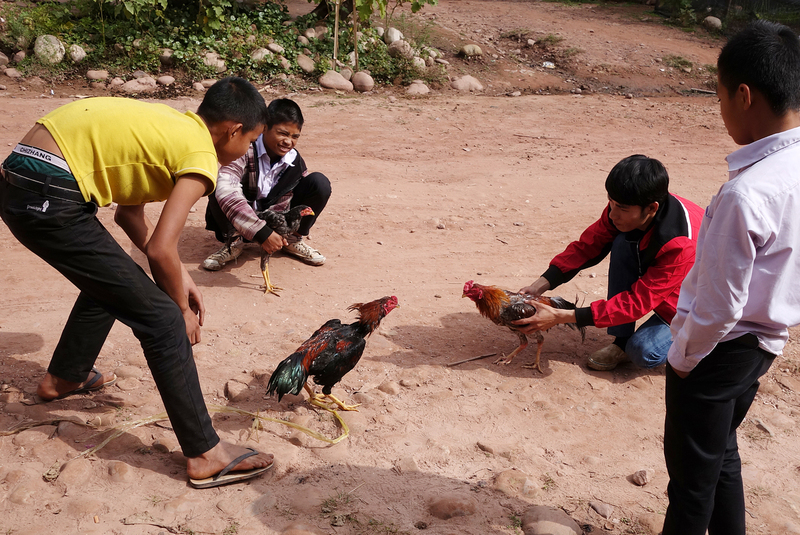 We asked some of the kids if we could take pictures and they were quite shy and looked away. 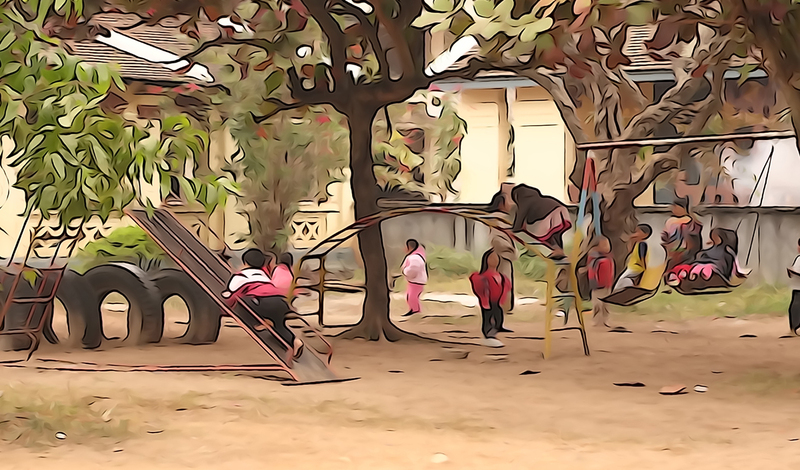 I was able to take a picture of a few shy but willing children and then showed them the digital picture. After that most of the kids wanted to see the pictures and began hamming it up for the camera. 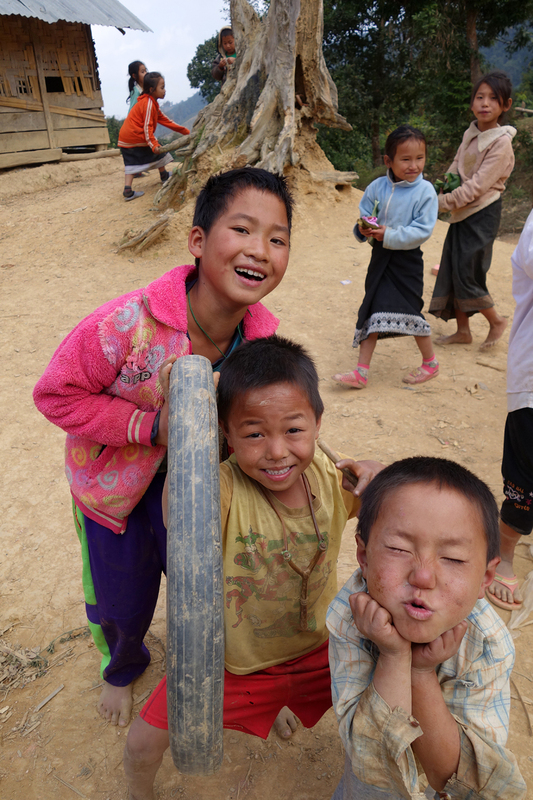 Children are the same everywhere; loving to see themselves and make faces for pictures. They were so enthusiastic that at one point I was so mobbed I could hardly stand up, as they gathered around to see all of the images. Jungle! no other word for this. 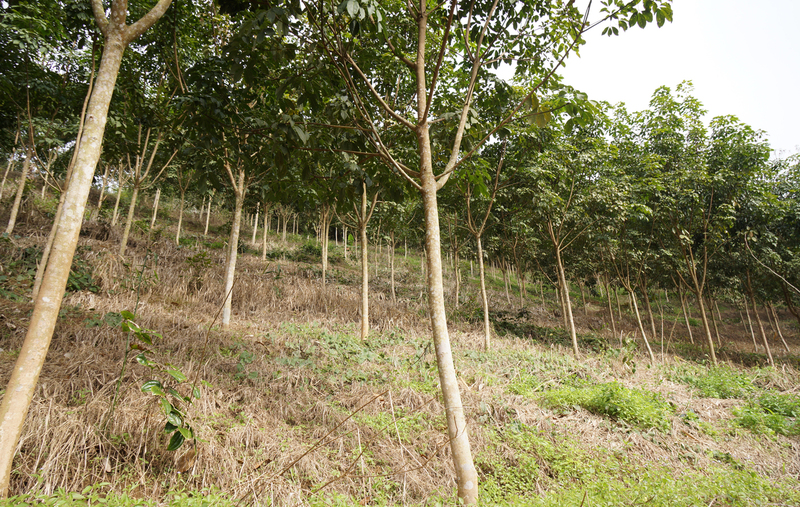 The habitat is an upper montane forested ridges with great bio-diversity. 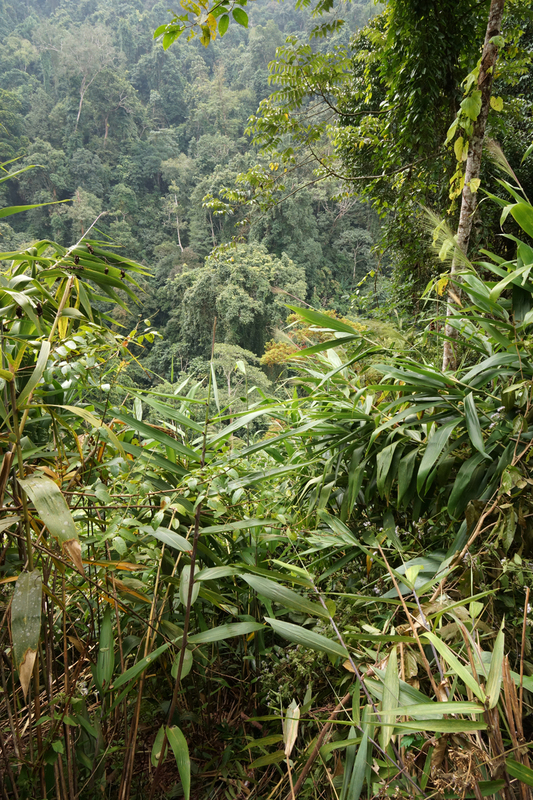 This dense forest covers more than 90% of the area here. 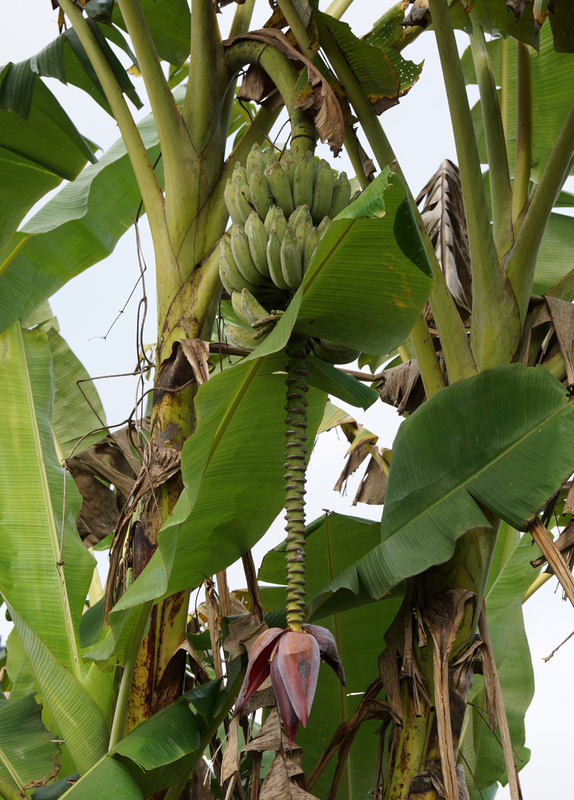 Lots of banana trees, and their flowers are magnificent! 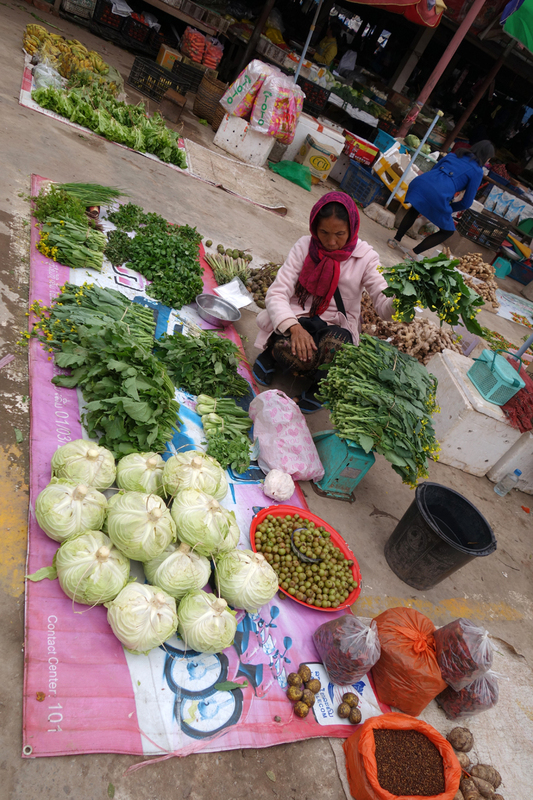 Lao people use the flower in many dishes, including salads where they cut it in small strips; very delicious. 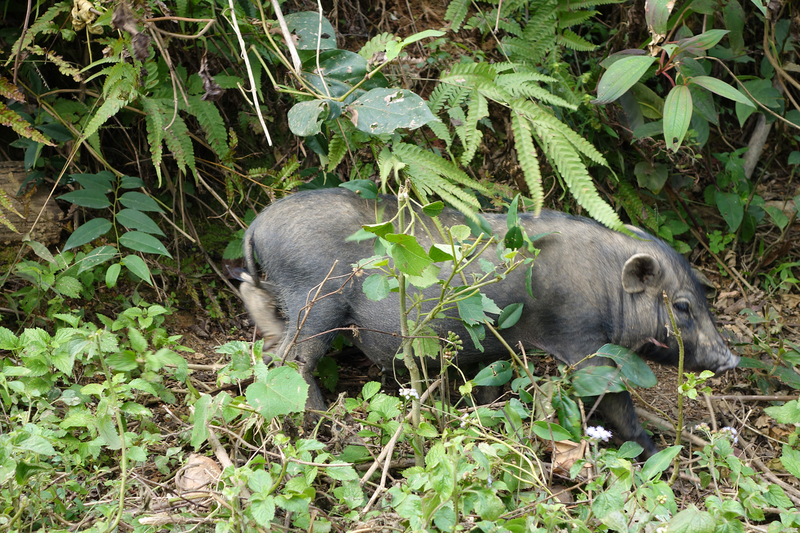 There are wild pig in these mountains (BIG tuskers we were told) but this little guy was an escapee from the next village. Approaching the village — these are the rice storage huts used to keep the new grain away from the moisture and predators. Local School. Kids a bit shy, but only at first. Children loved seeing the digital images of themselves! innovative use of an old moto-wheel rim. 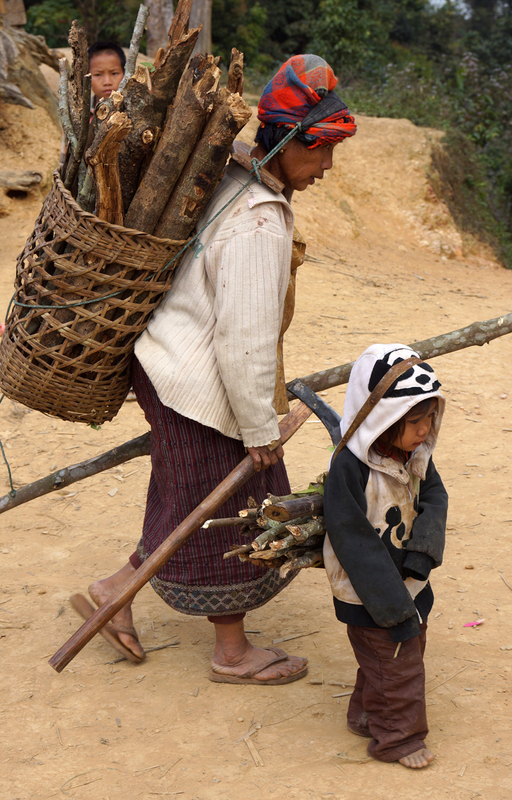 3 sticks, someone to push, and off you go down the hill. The adults don’t want to be photographed, but she gave Gary permission to take this picture. We hoped to capture her smoking her pipe, but think she was a bit embarrassed. 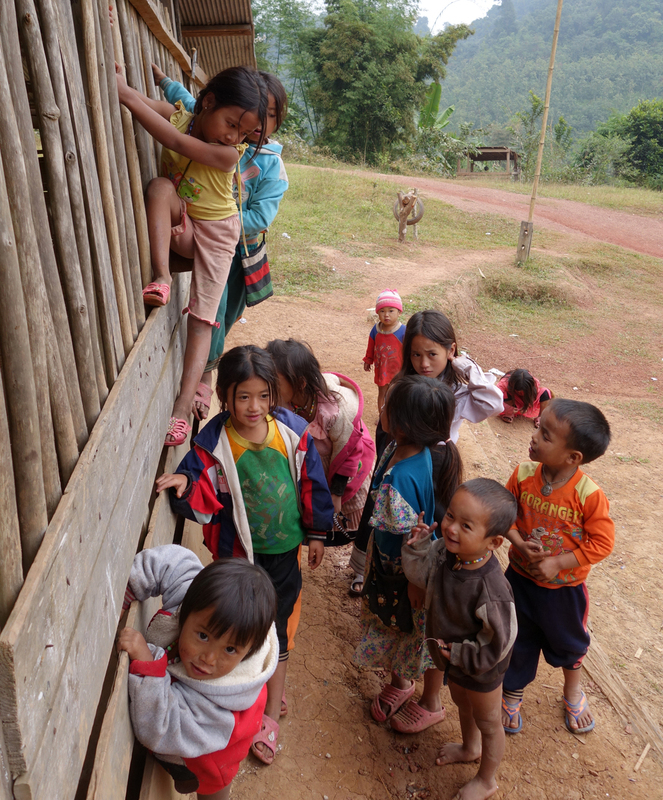 Pre-schoolers watching us strangers walking through their village. 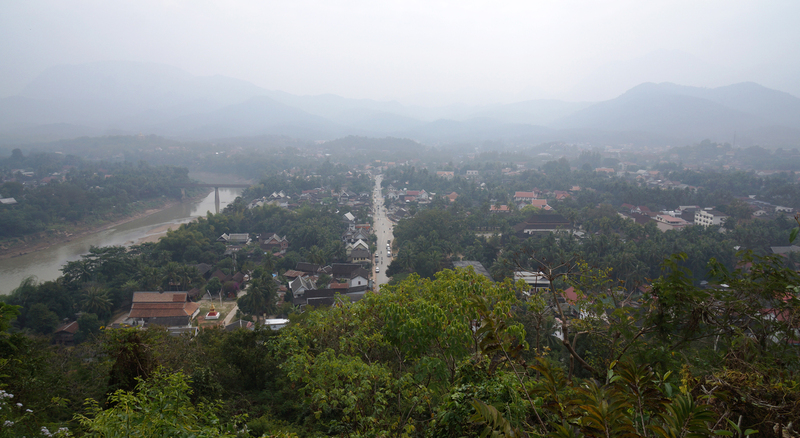 They don’t see many farang up here in these valleys. their typical home. No electrify but note the pole with a small solar cell on it. 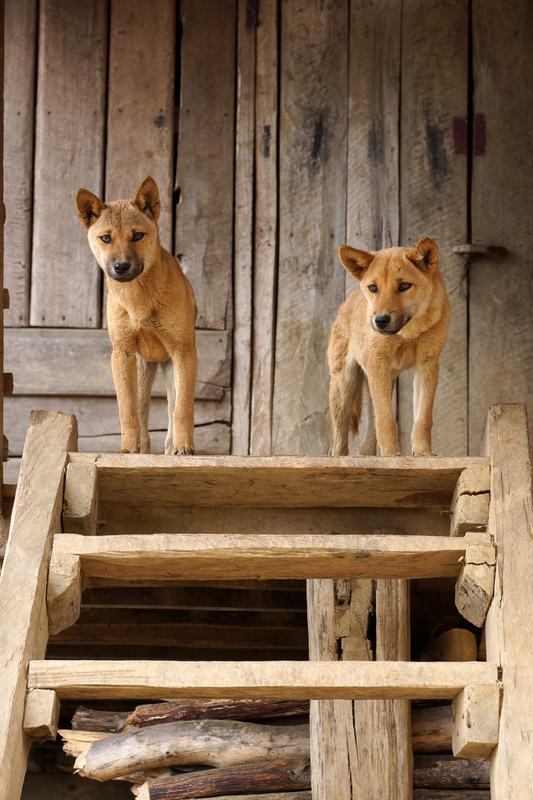 Dogs are revered here, as pets, playthings for kids and guards of their property. A kind villager who was very interested in meeting us, though we communicated only with gestures. 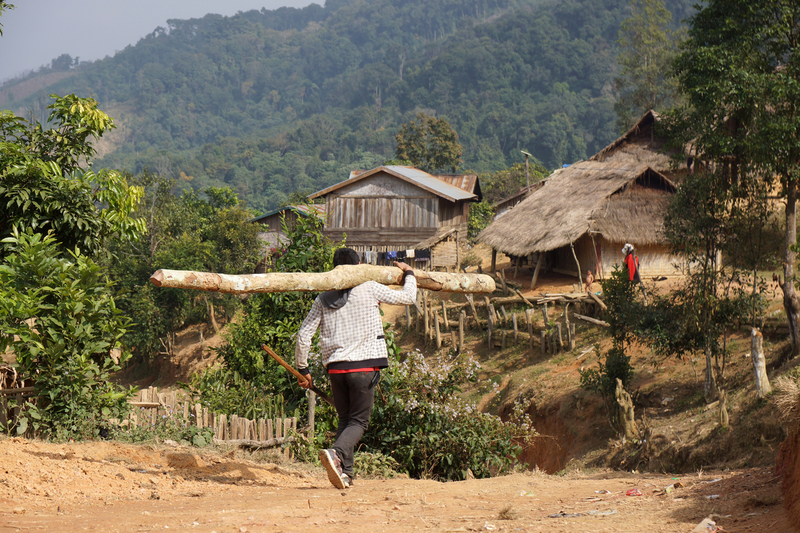 This young man is carrying a very heavy pole he had just used his machete to cut down in a near-by forest. Gary had him stand it on end to see if he could lift it, but decided it was at least 200 lbs! Passed on this one. Back where we started our loop up and over the mountain. A good 15 km hike! 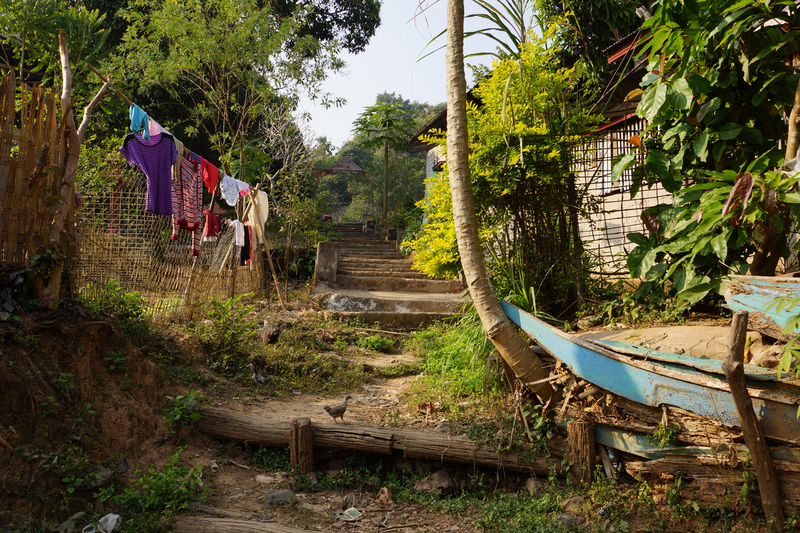 We returned from the village and walked to the Ban Nam Dee waterfall, where we relaxed before heading back to Luang Namtha and our cottage. 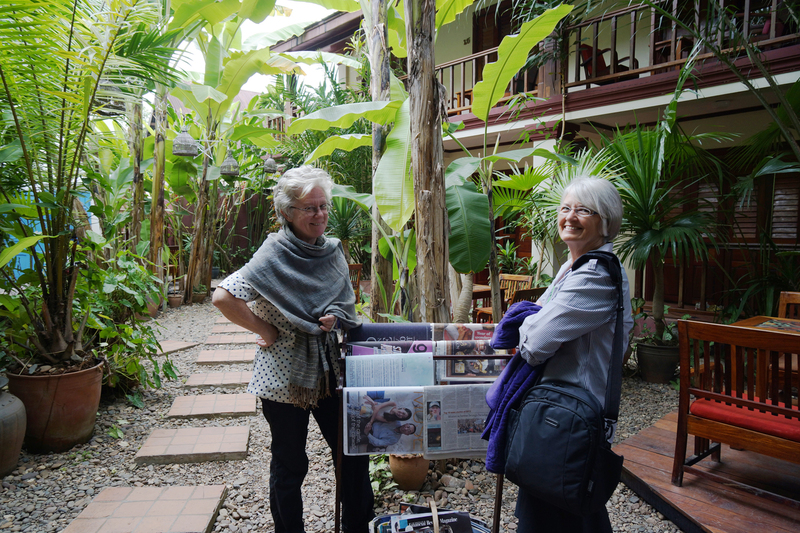 The next morning after a hasty breakfast we started on a 30 km bicycle trip through several villages around the Luang Namtha Valley. We had a fantastic local guide on this enjoyable outing. 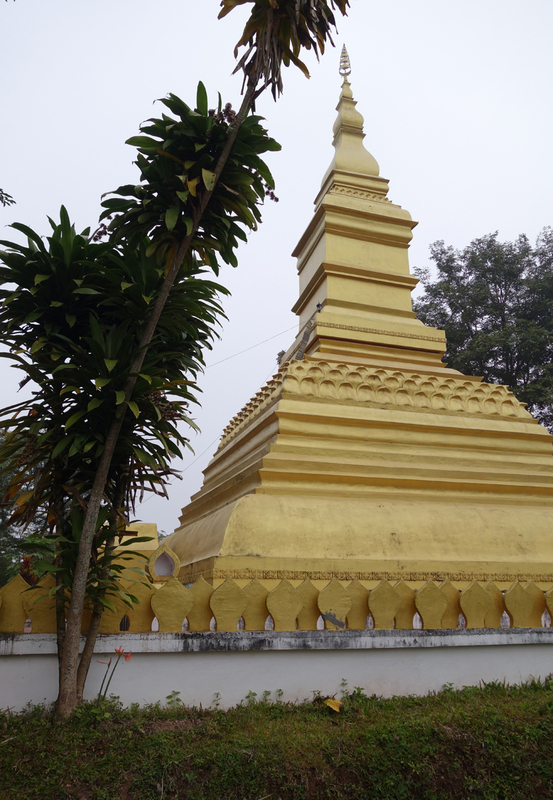 As we stopped to climb to a golden stupa high up on a hill in the countryside, he told us that an American bomb had destroyed it back in 1975 at the end of the war. The villagers have since built a new one next to it. We talked about the war and he said (very much like the Vietnamese), the Laotian people have moved on, and they look to the future not the past. 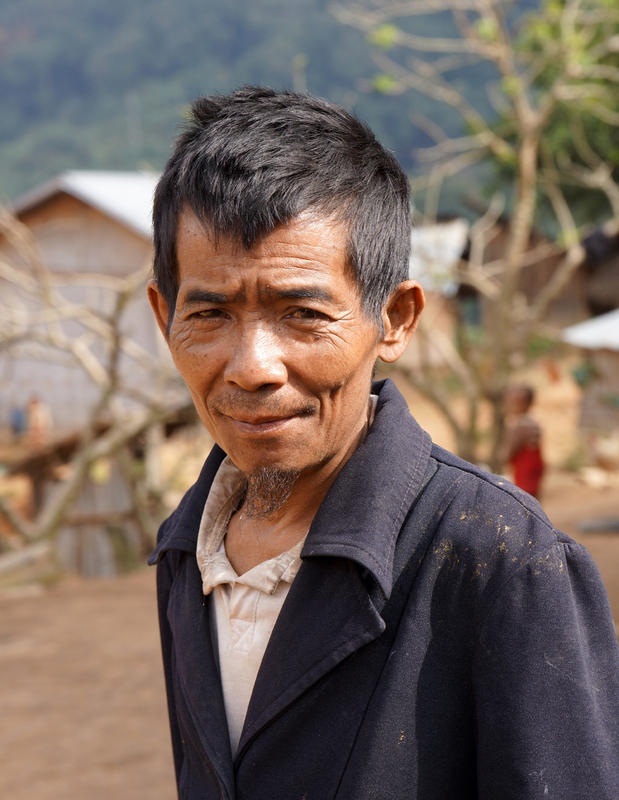 But it was an uncomfortable moment when he told us that his cousin had been killed from a land mine explosion as he was working to plow a new field. 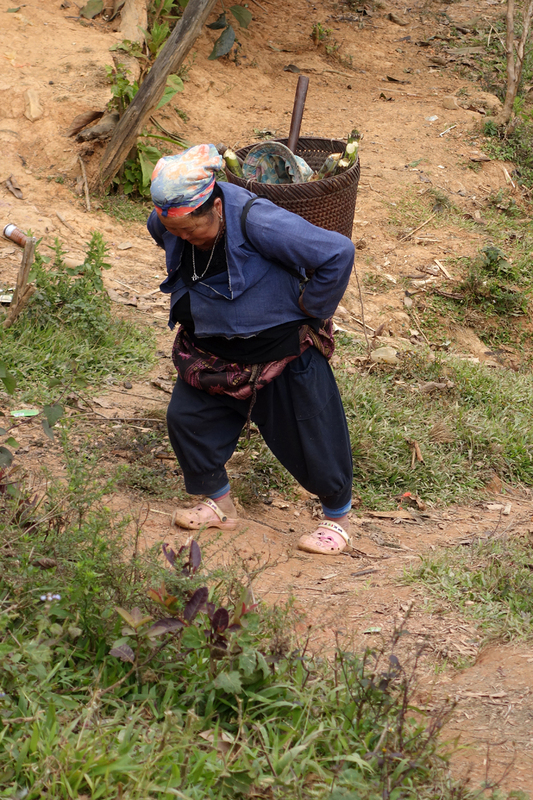 We then cycled to the villages of the Ahka minority, Black Tai minority, and the Tai Leu minority. These were all very interesting communities. 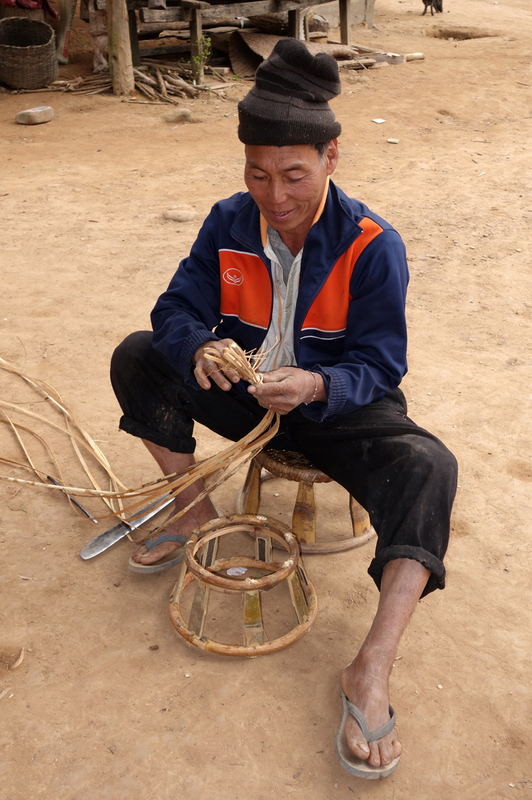 This man demonstrated how he was making these stools from bamboo — fascinating. Don’t need to describe this activity. But combatant on the right decided this wasn’t his time, and moved away. 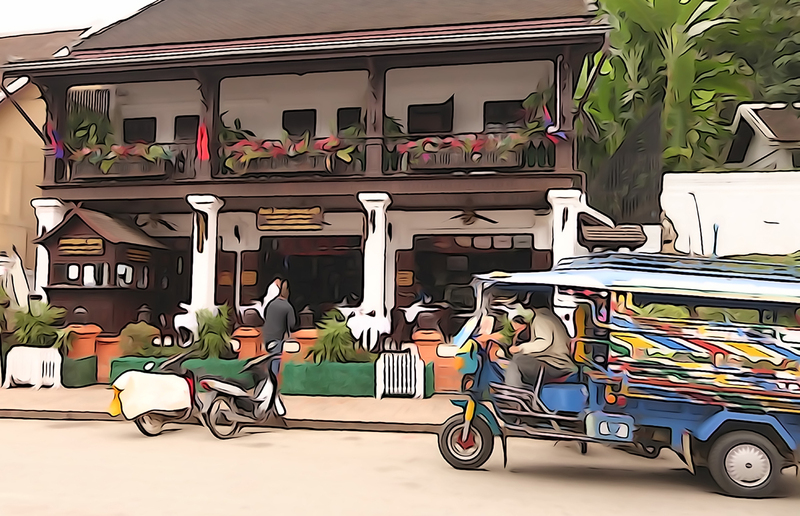 On New Years Eve we drove another 60 km north to the town of Muang Sing ,which was another long drive. 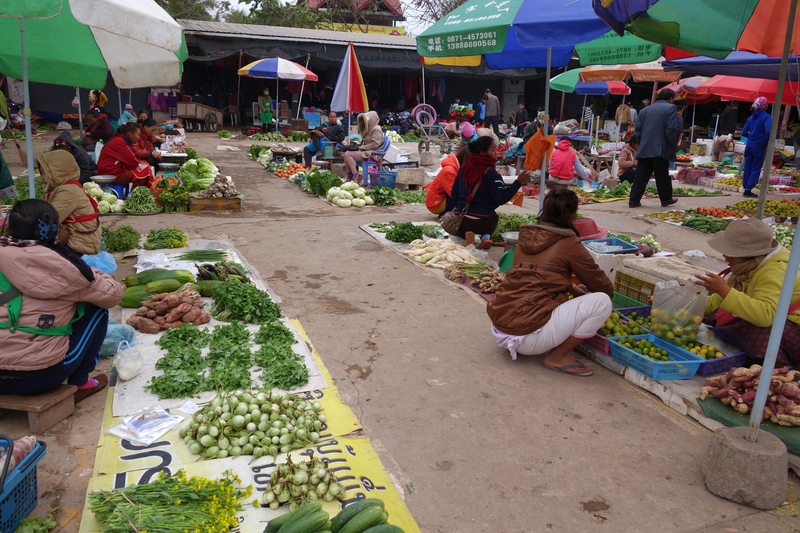 Muang Sing doesn’t have much to offer in the way of tourist delights, except for a morning market which is quite large and is attended by literally dozens of different ethnic groups gathered to sell their produce and wares. It was unusual, and we didn’t see any other caucasians attending. Definitely a market for tribes and villages to come and sell and buy what they need. The Lotus Villa Hotel where we stayed was nice, but it was New Year’s Eve and the party gathering for the entire town happened to be right next door! . . . so we heard loud music and singing (OMG, Karaoke!!) until well into the wee hours. 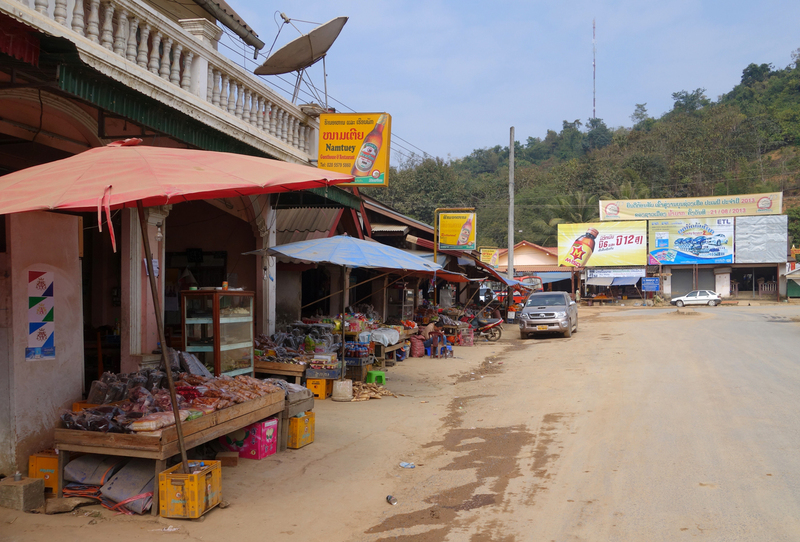 Then up early the next day to attend the market and gear ourselves for the long long ride back to Luang Prabang: YES, the same *&#@&* stretch of road we had just travelled to get up here, all 300+ km of it!! 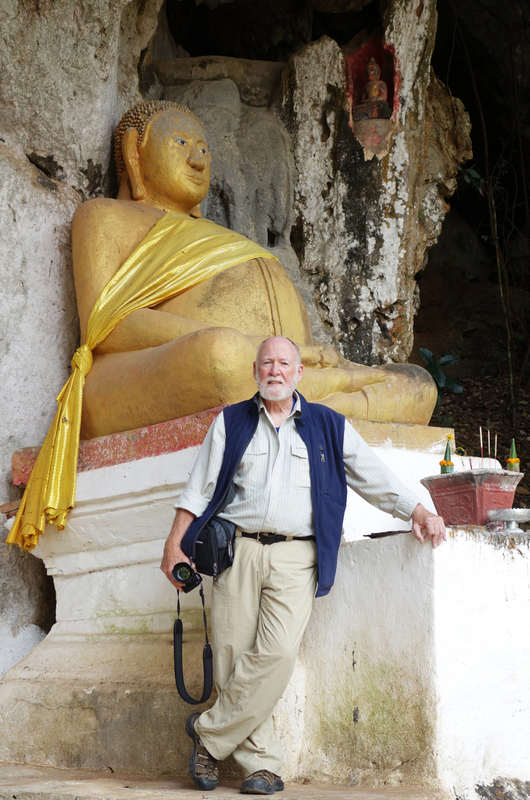 While we had some great experiences in and around Luang Namtha, I don’t think we would have spent two long days of traveling such rough roads to get here had we know. 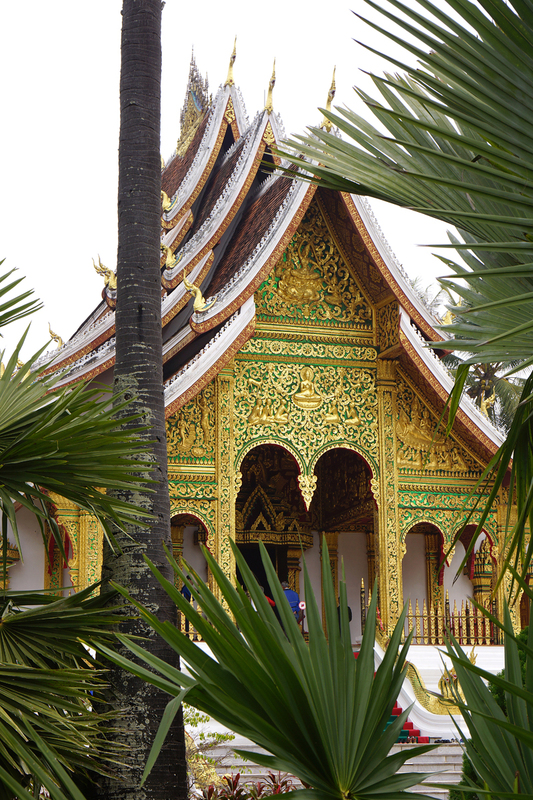 Give us the quiet, laid-back comfort of Luang Prabang and time! lovely produce, and we are already missing the great quality. Chilies everywhere. and these are HOT buggers! ‘Sweets’. This is the morning market equivalent of the candy store. All made fromm rice! 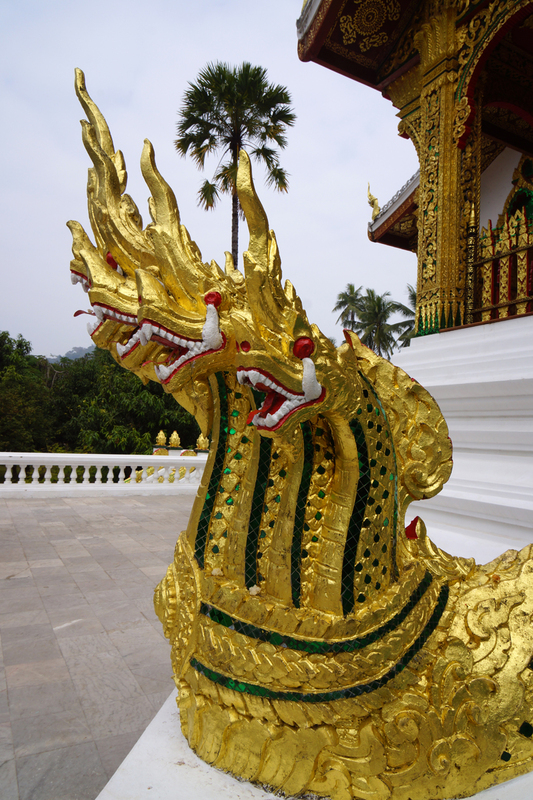 We loved being back in Luang Prabang, and spent several more days exploring, sightseeing, just relaxing. 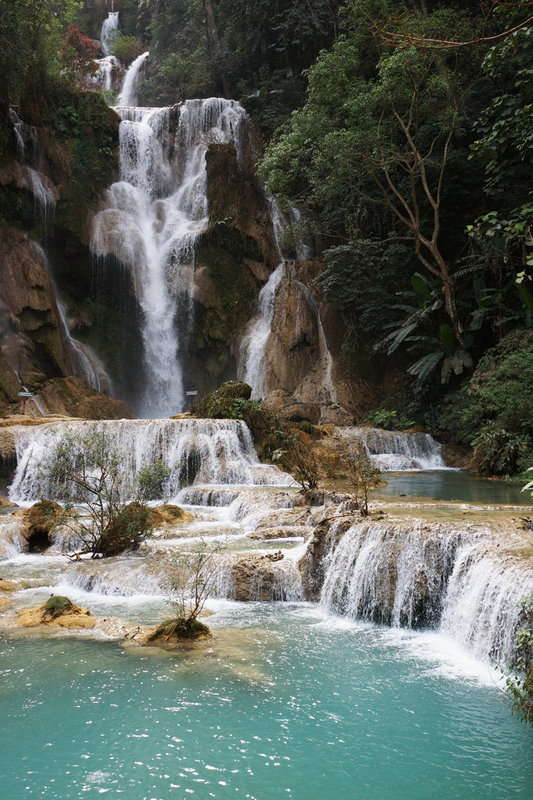 We took an excursion to the waterfall outside of Luang Prabang (see our previous post). It was delightful. If it had been warmer we might have gone into the beautiful pools. Next stop? 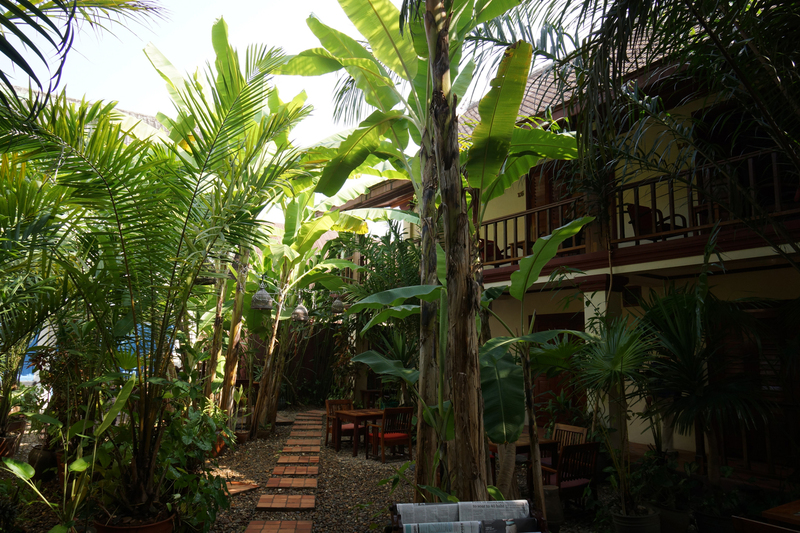 Northern Thailand, with a start in Chiang Mai. 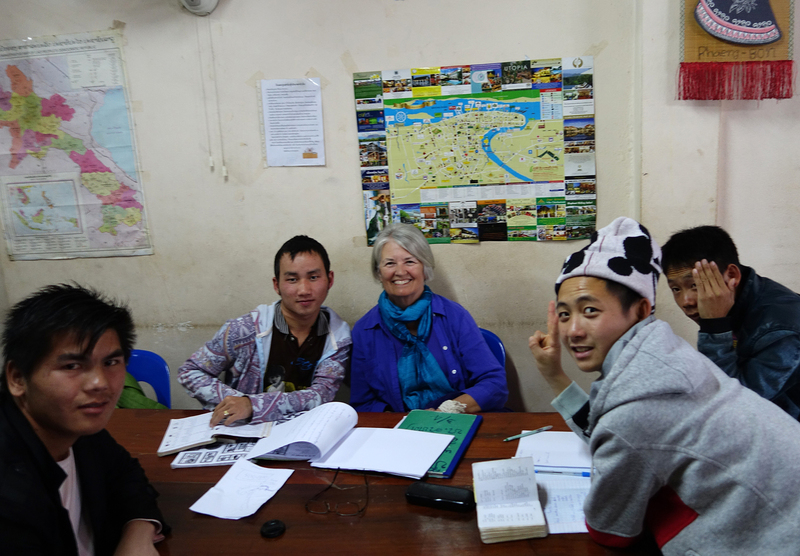 After another overnight train ride, this time in the reverse direction, from Sapa back to Hanoi, it was time to say good-by to Vietnam and catch a plane to Laos. 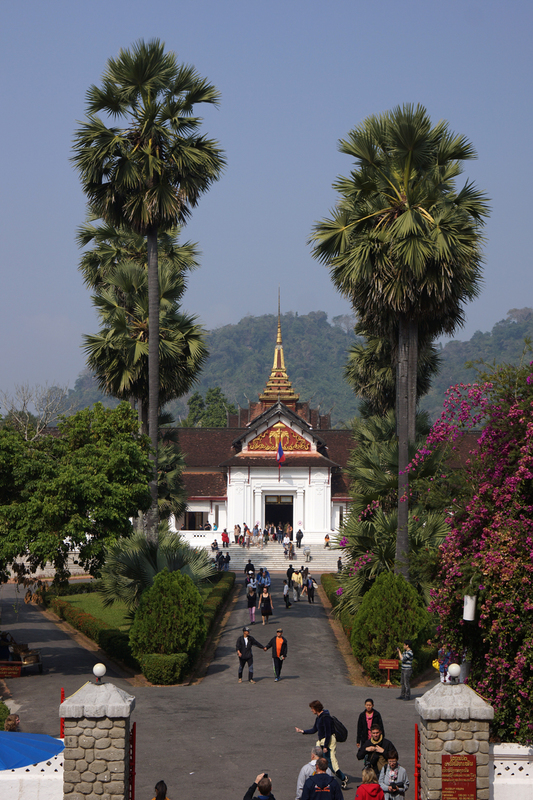 Luang Prabang was once the imperial capital of The Royal Kingdom of Lao, and is located in north central part of the country, at the confluence of the Nam Khan and Mekong Rivers. 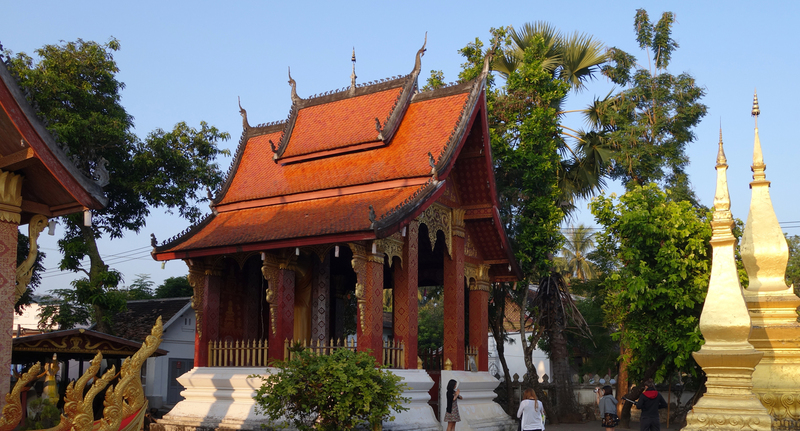 In 1975, with the fall of the country to the communist Lao government, the capital was moved to Vientiane, and Luang Prabang began to assume her ultimate role of a sleepy backwater town in the hill-country of the north. 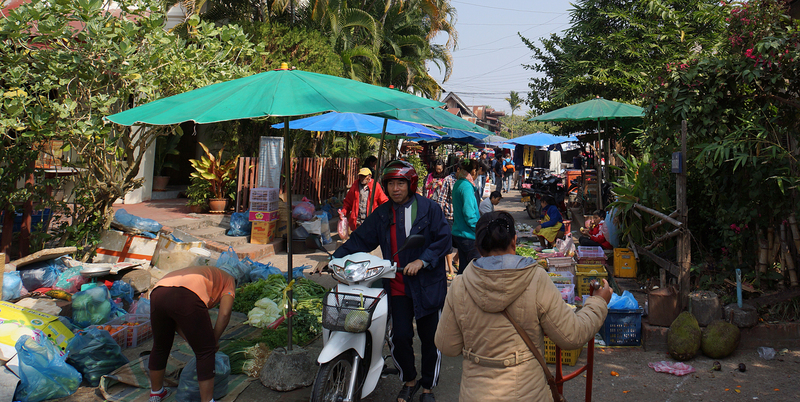 Today, there are roughly 50,000 people in the city, but everyone moves at a decidedly slower pace here; such a contrast to the cities of Vietnam we had just left! 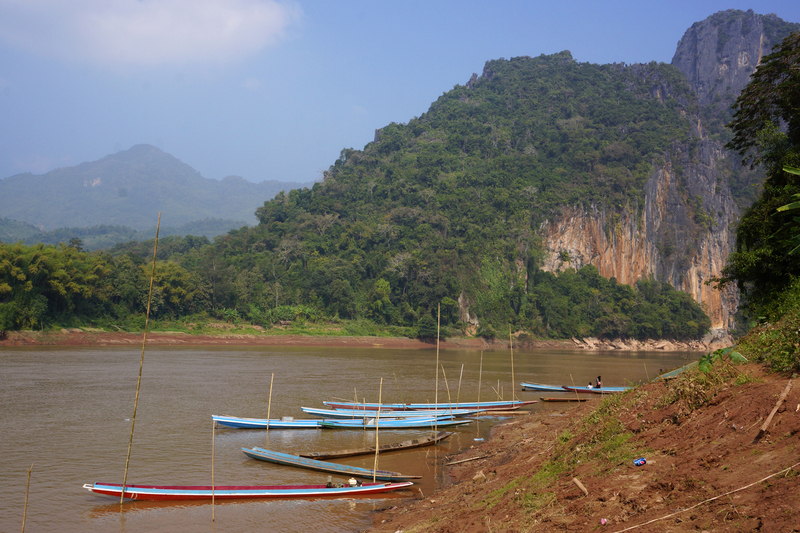 The Mekong, of course, is one of the largest rivers in Asia,with its headwaters high up on the Tibetan Plateau. 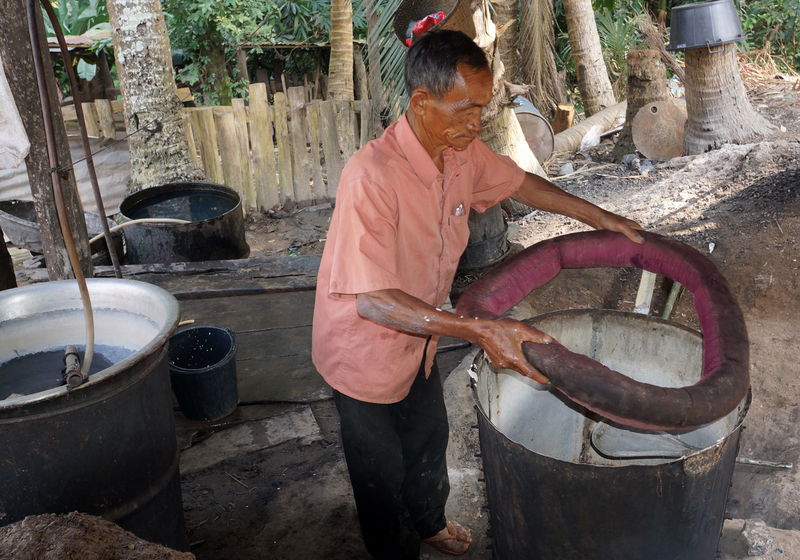 It flows through China, Burma, Thailand, Laos, Cambodia and meets the South China Sea in Vietnam. 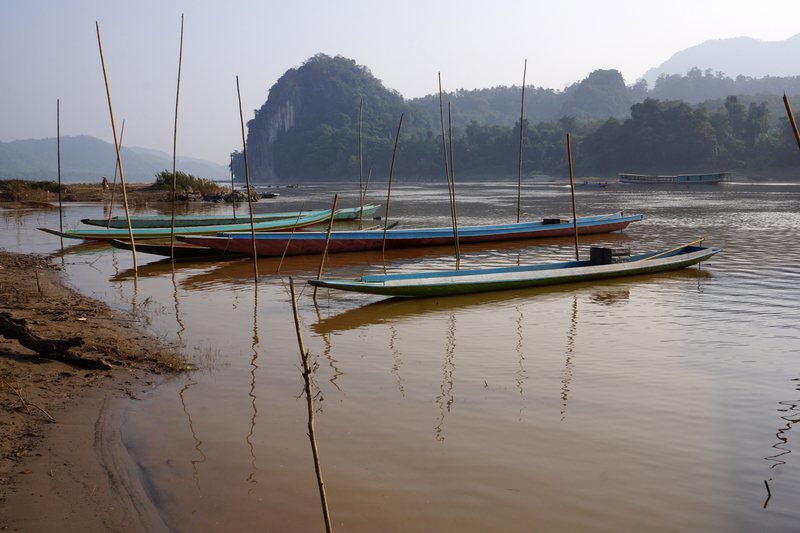 It’s the longest river in Southeast Asia and one of the 12th largest in the world. 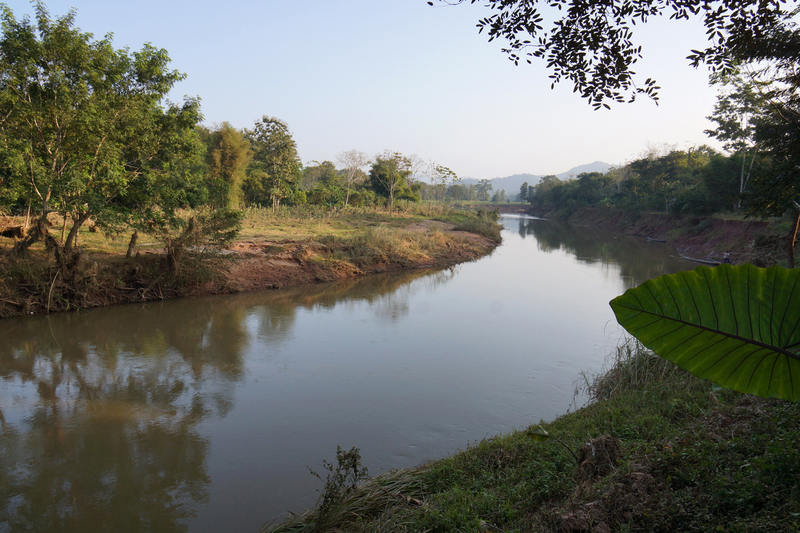 Over 60 million people depend on this river and it’s tributaries for food, water, transport and most other aspects of their daily lives. 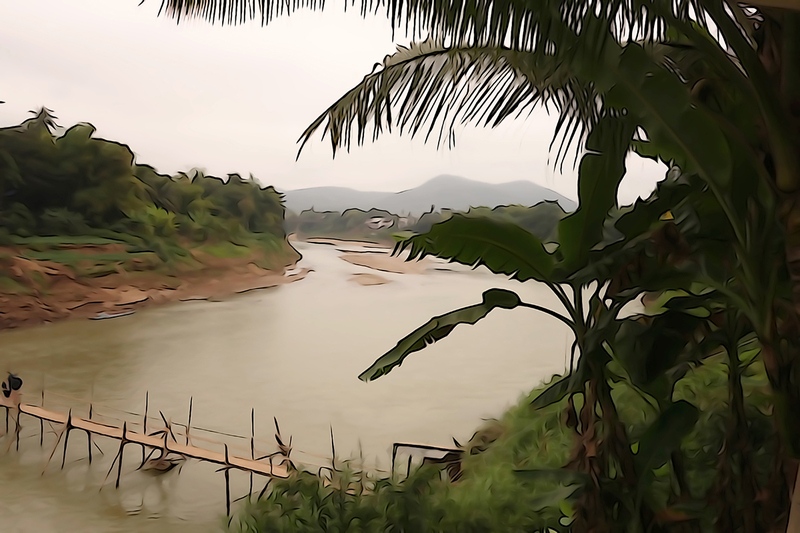 China has recently been building a number of dams on the Mekong, and has several more planned: collectively,these dams threaten this complex eco-system in a variety of ways. The impacts on fishing and farming alone will be dramatic, and we were able to see a bit of this as we traveled upstream later in the week. 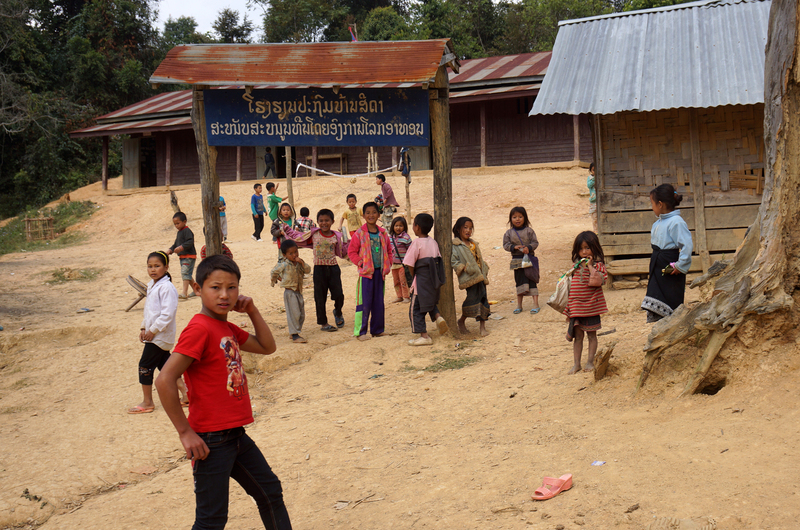 The Lao government is a very poor one: thus, China has provided money and expertise in building all sorts of infrastructure here, such as roads, dams, hospitals, etc. The result? 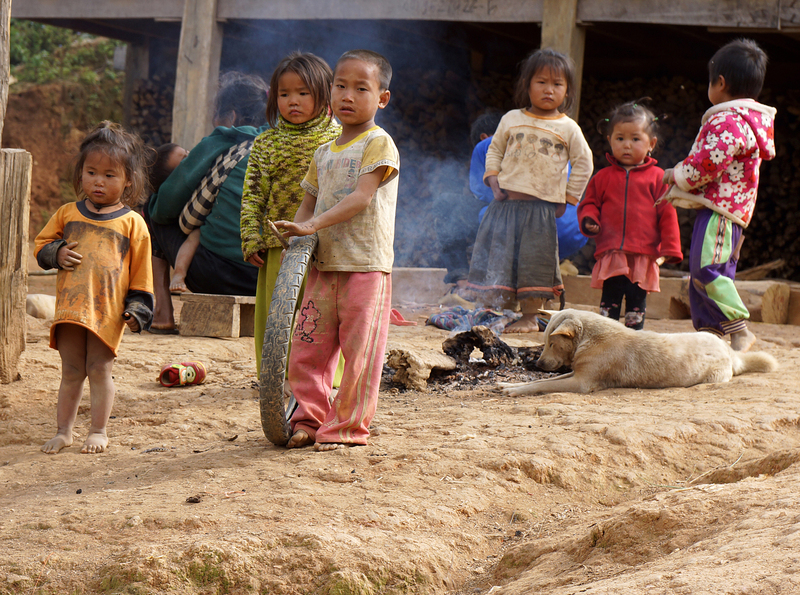 It’s hard to say ‘NO’ politically when they want to build new factories in Laos and use the electricity from the dams for their own purpose. 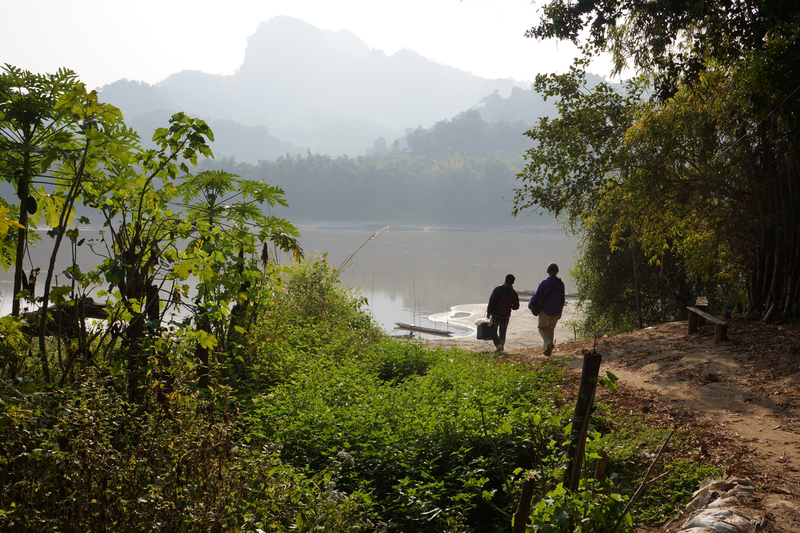 Many told us they believe Laos is becoming another province of China. 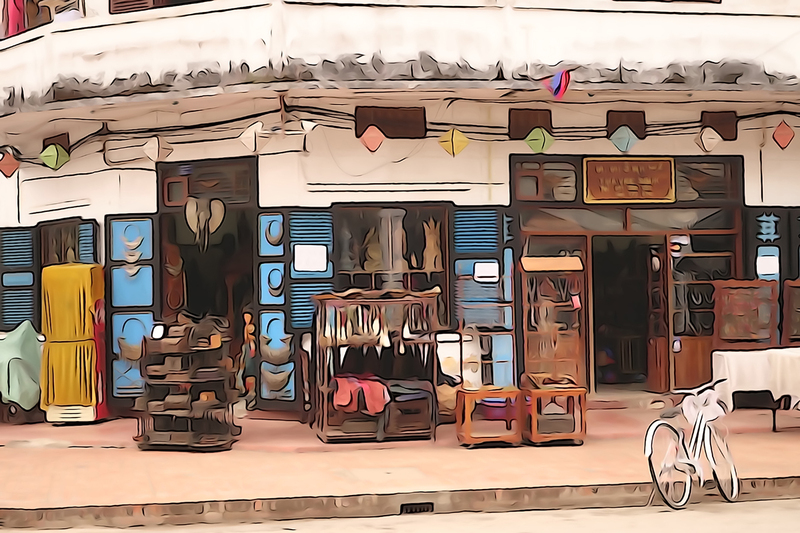 The far north here does feel this way, but it must be noted that the Chinese have provided an outlet for many Lao goods and products, which provide much-needed income to some very poor villages. 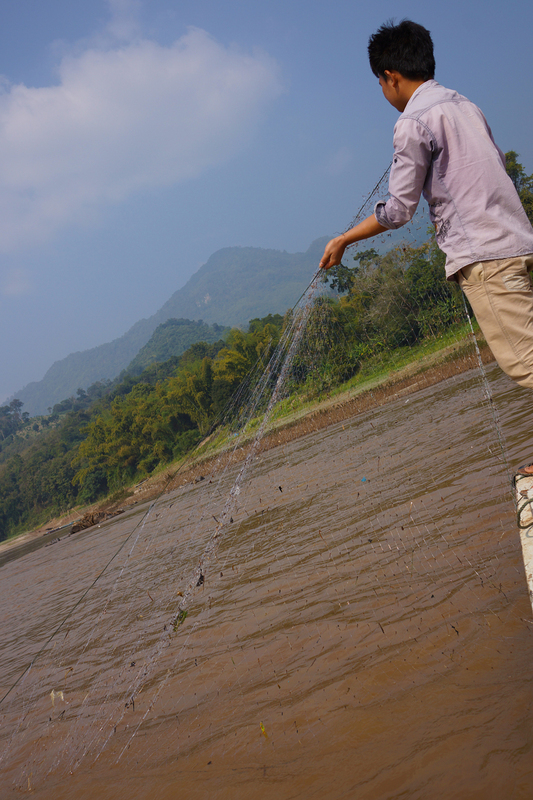 On a short trip up the river to the north of Luang Prabang we saw the results of this when we visited some fishing villages. The river had flooded just a few weeks before and ruined most of the planting of crops along the banks. (there is no such thing as disaster insurance up here . 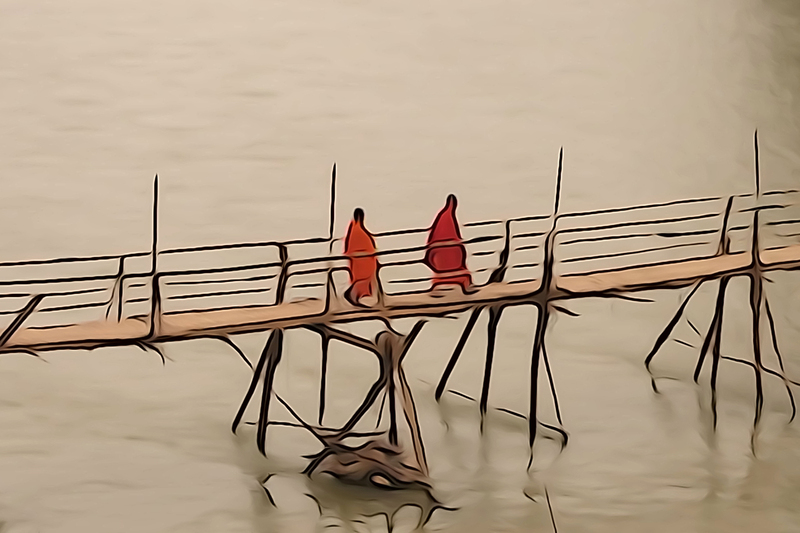 . . ) The prevailing thought is that China released water from recently constructed dams and failed to tell any neighboring countries down-stream on the Mekong. 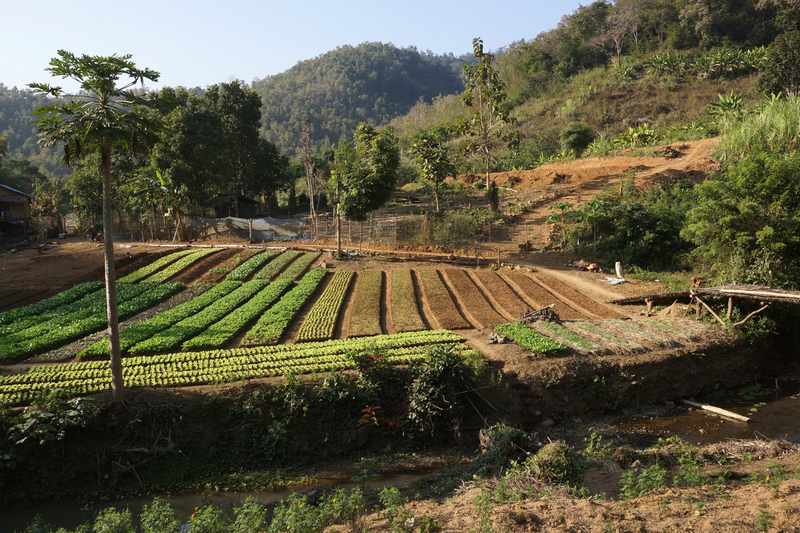 This is the dry season and the villagers use the rich soil of the riverbanks to grow corn, peanuts, beans and other crops. A devastating event for them. 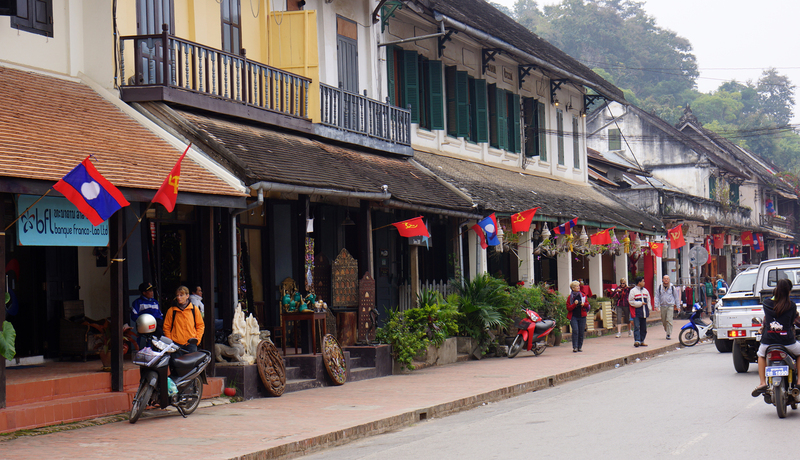 The old town of Luang Prabang is today very much a quaint tourist town. Could be an early New Orleans or Carmel for all the wonderful shops and restaurants with French influence in both food and architecture. But then again, so different with all the food markets, selling magnificently fresh produce daily, night markets selling hand-woven and -created articles (plus an awful lot of Chinese imported tourist trinkets), and the 55 or so unique ‘Wats’ (temple complexes). 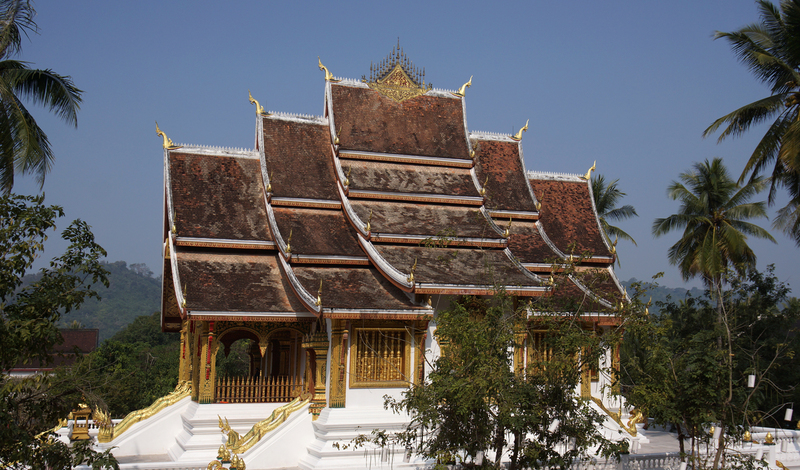 Much of Laos, especially here in the north,adhere to “animist” beliefs, while Laung Prabang is still very much Buddhist, with hundreds of monks living, learning and working in the different Wats. Enjoying the veranda, and not wanting to leave LB! 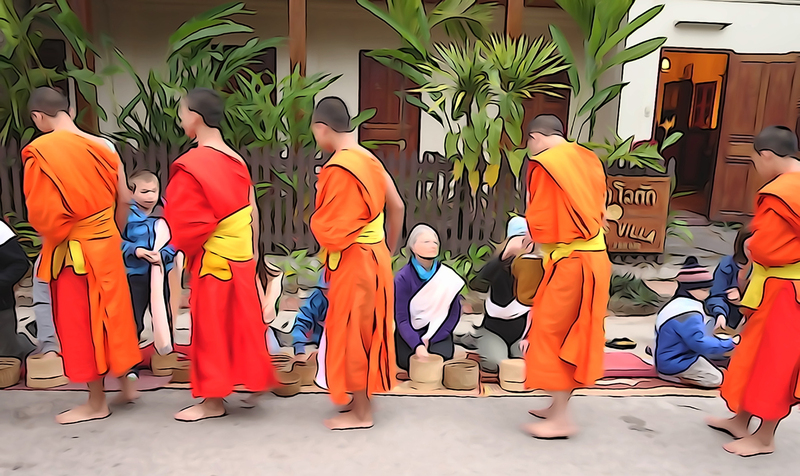 At one of the temple complexes we saw a group of monks getting ready for a trip. They just kept coming–there must have been 20 who piled into the van along a dog. Looked like there was a picnic lunch put into the van also. 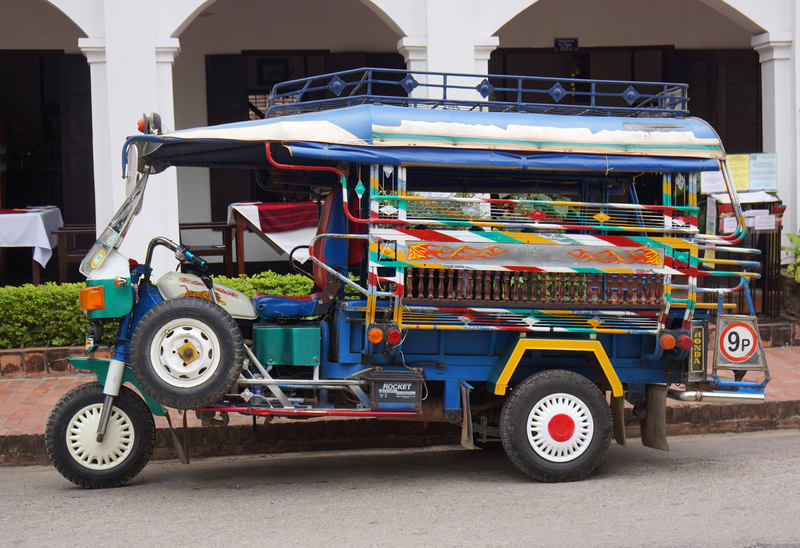 One of the elaborate tuk tuk’s in Laung Prabang. Easy to find one anywhere, but walking is the modus operandi here! 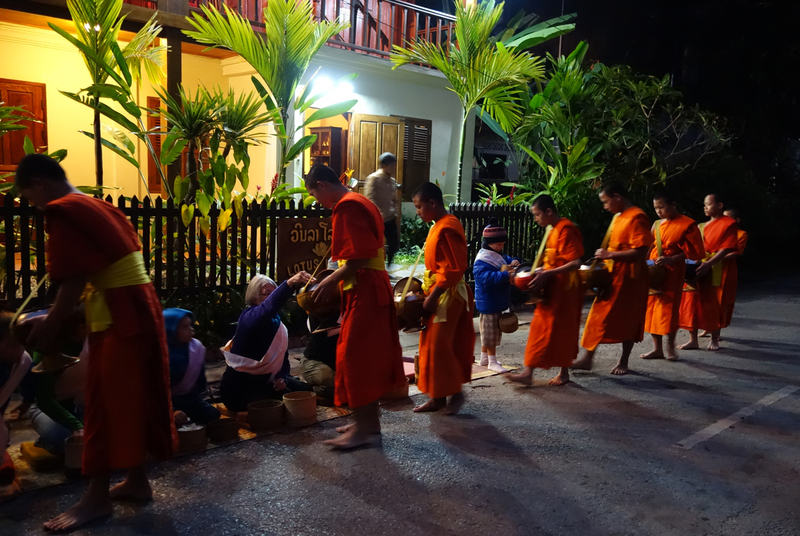 We participated in the daily giving of alms one morning in front of our little villa. 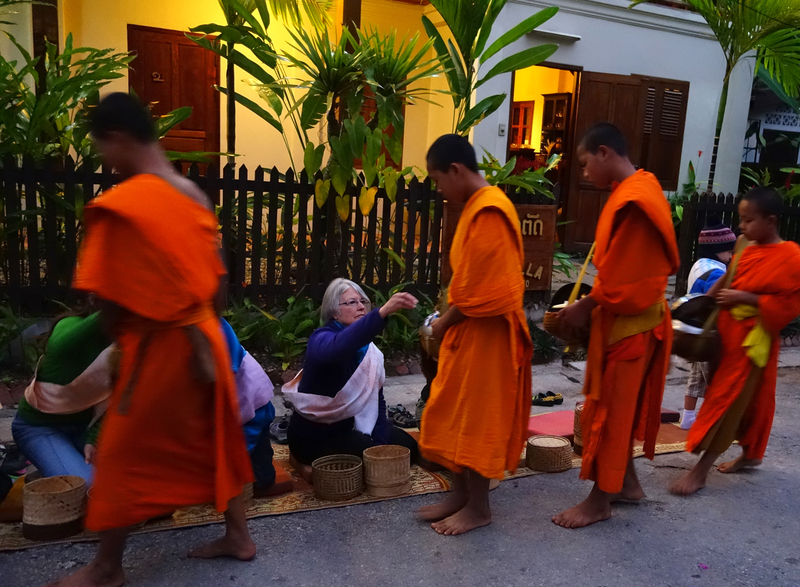 There were ten or more groups of monks (barefoot) who pass by the hotel early each morning and locals, plus some touristas like us, offer portions of ‘sticky-rice’ for their daily rations. 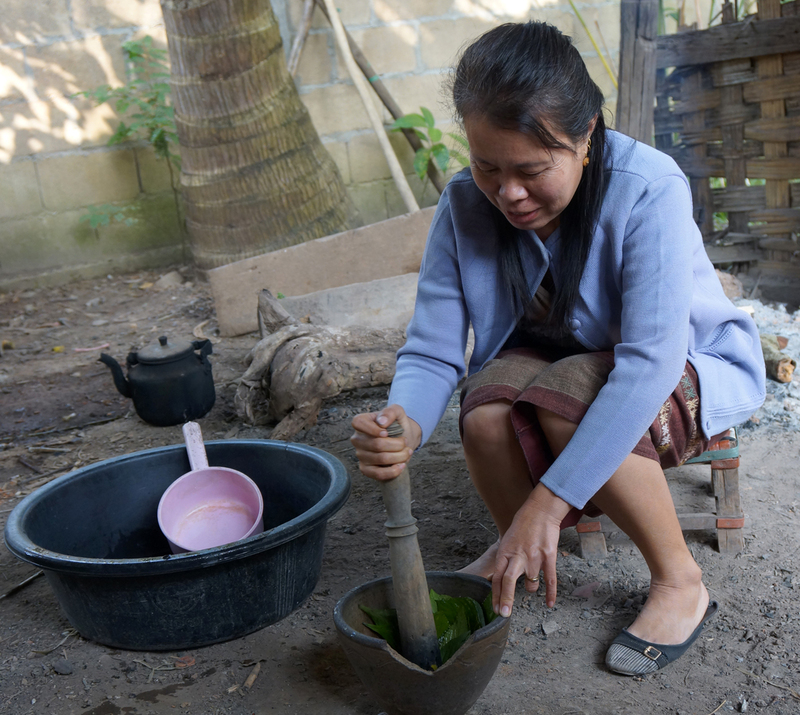 The local people also cook the meals of soup, meat, and vegetables every day, but the monks traditionally only eat breakfast and lunch. 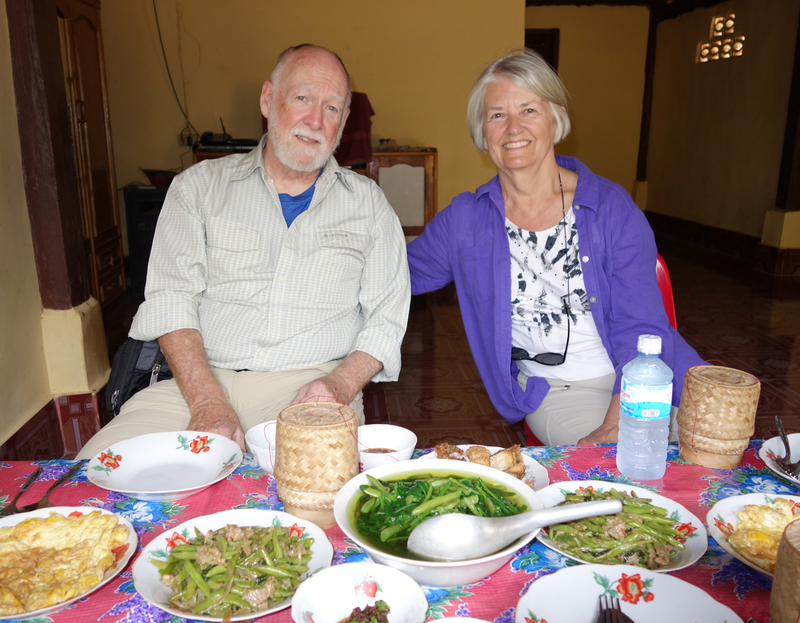 Gary and I often went without dinner as the breakfasts and lunches provided have been very large portions. 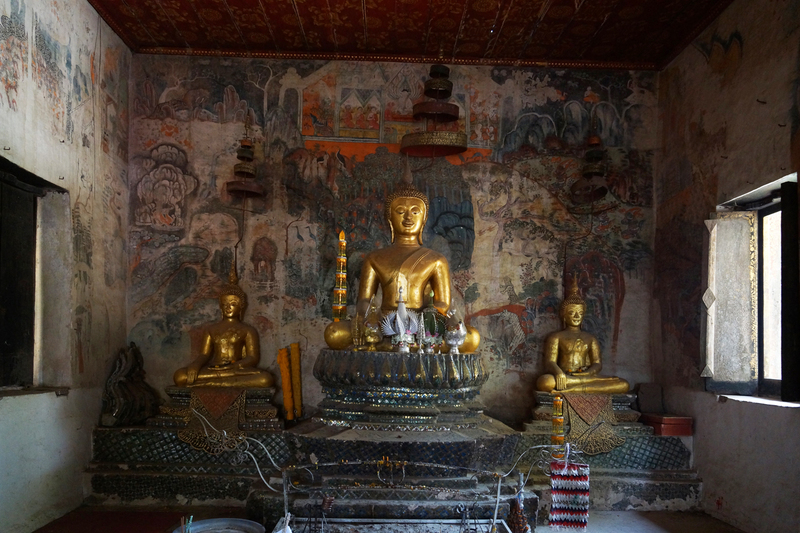 It is difficult to watch just how rude some tourists have become, trying to get pictures in every way possible, including sticking their cameras into the monks’ faces, and popping off a flash. 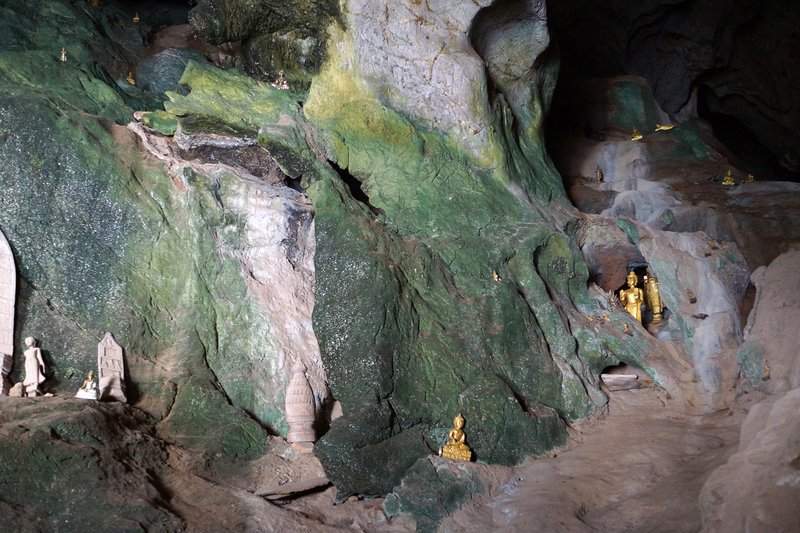 Hopefully what we encountered was an anomaly, and most are respectful of their lifestyle and religious customs. 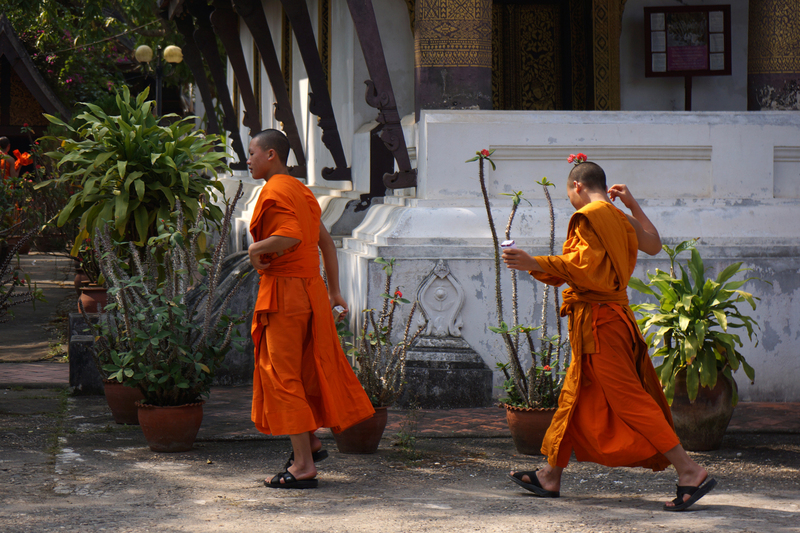 Local devout Buddhists waiting for Monks to pass by. We spent some very enjoyable time at ” Big Brother Mouse “ , conversing and reading with students anxious to learn English. 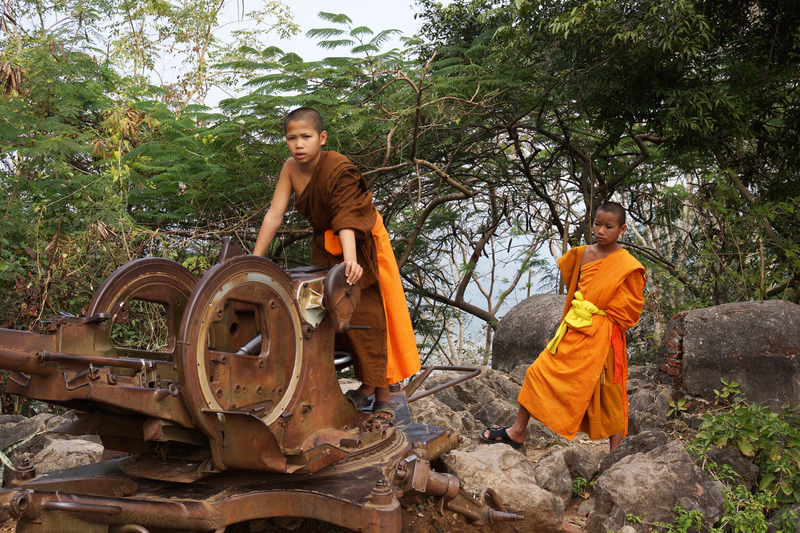 Some of the young monks also attend hoping to improve their English-language skills. 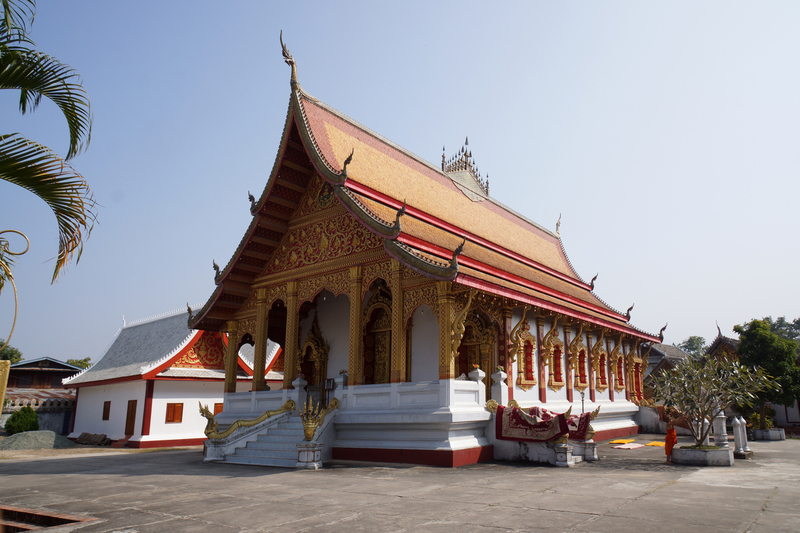 Most of their language teachers in school, or in the temples, are not native speakers, so they actively seek out any opportunity to engage English, Austrialian, and American speakers. Big Brother Mouse also provides books from donors so they can improve their reading skills. A GREAT way to spend some time in LB, and they can use not only your time, but money as well! 😉 Here’s their website: look ’em up! 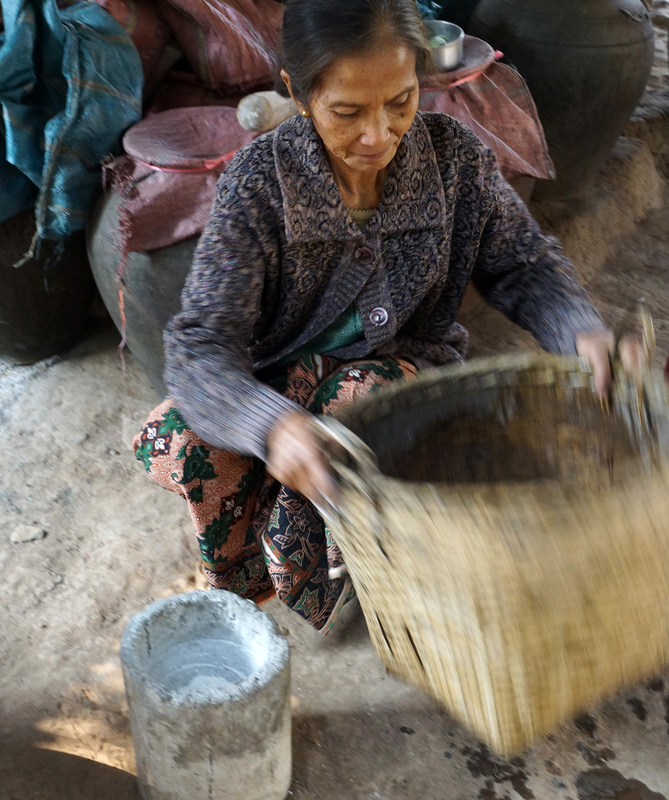 The villages along the Mekong have been encouraged by the government for environmental reasons to stop the slash and burning of rice fields further up in the hills and need to find new ways of making a living by growing other crops to sell, create crafts skills to sell to the tourists such as weaving, whiskey making, paper making, etc. 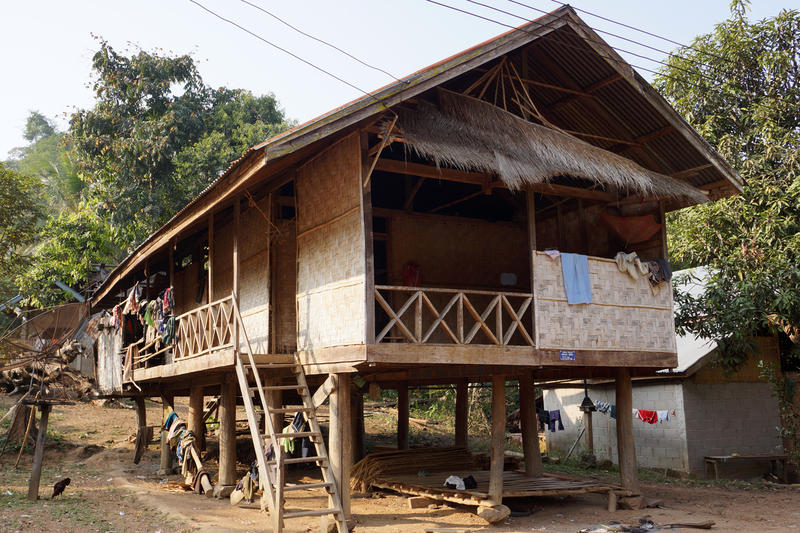 It has taken some of the villagers ten years to make these changes. 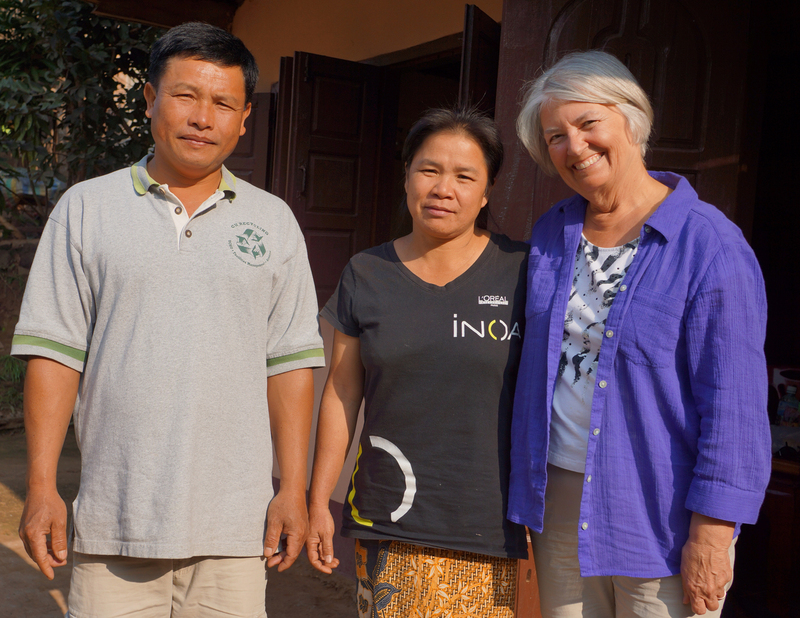 We stopped at the small village of Ban Kok and had a home cooked Lao lunch with the Chief of the village and his wife. 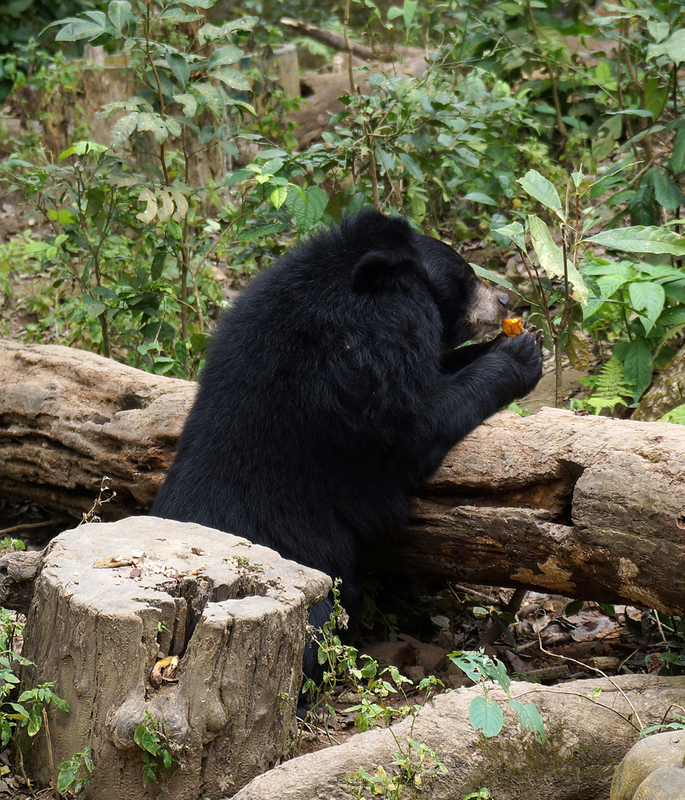 They were delightful and fed us so much food that we couldn’t eat all of it. 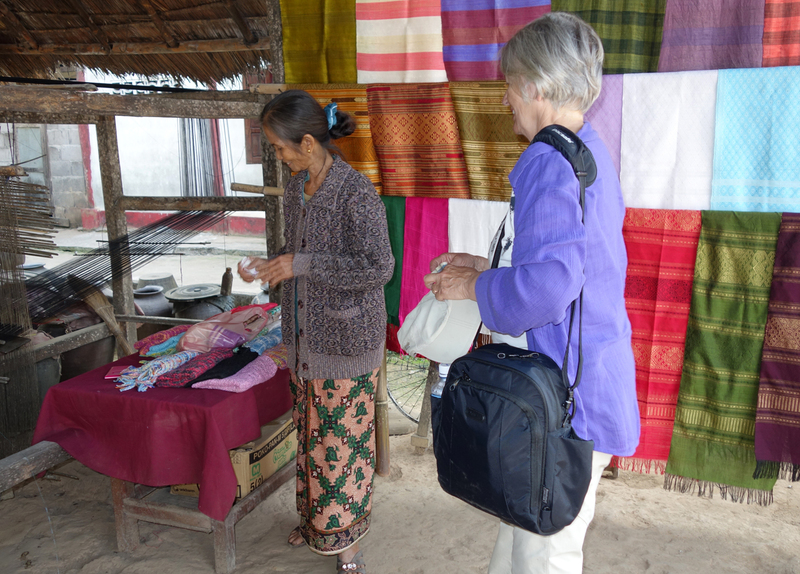 We enjoyed learning more about life in the village and the challenges they face to make a living. 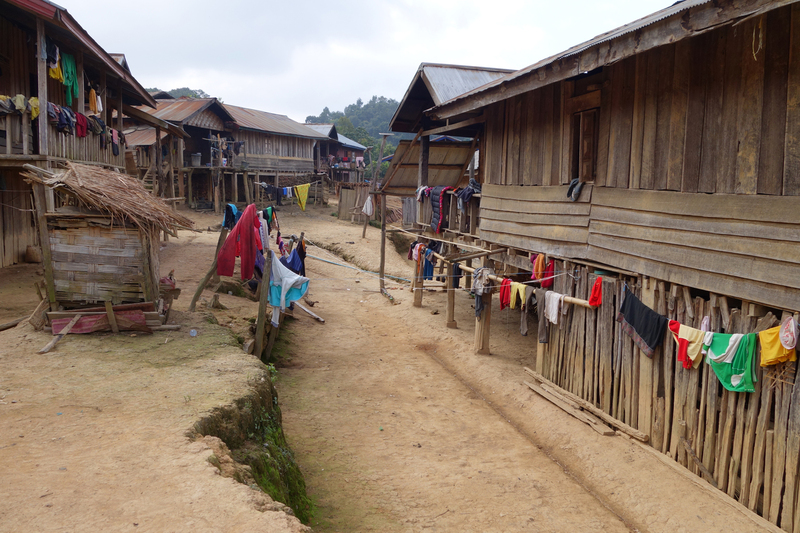 This is one of many villages that is struggling to make a good living for everyone now that they can’t slash and burn their rice fields. There are 30 families living there. They had just planted peanuts on the river shore, but it was wiped out during the flood the week before. The village. Very basic; very small. 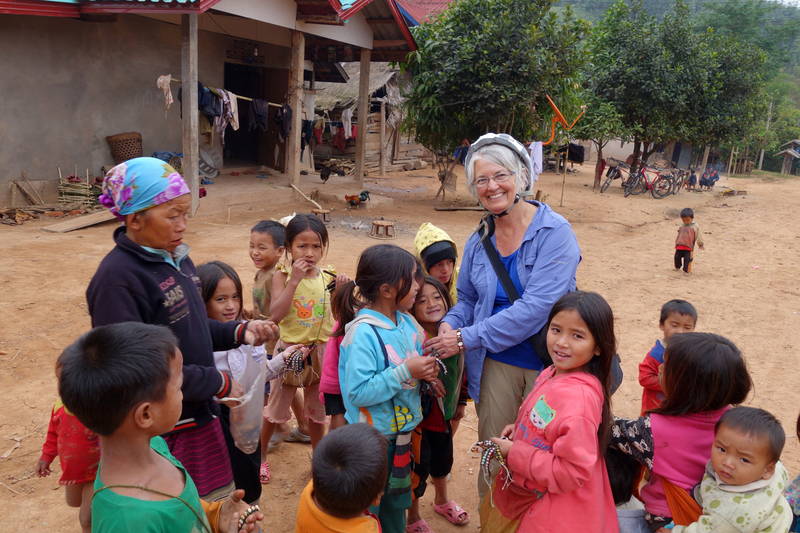 We drove north of LB about 30 km to the village of Pak Ou, at the junction of the Ou and Mekong Rivers. 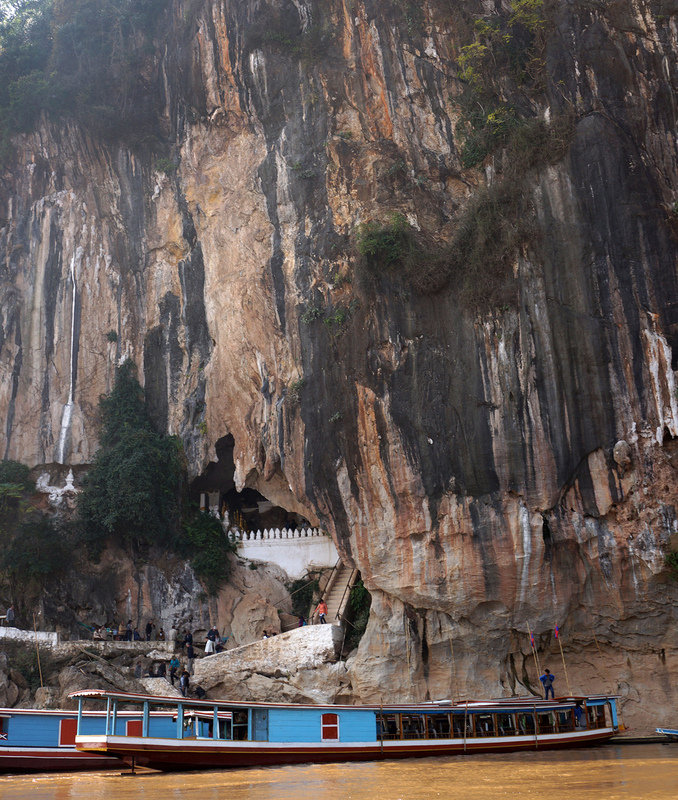 From there we boarded a small boat to visit the Pak Ou Caves, famous for the thousands of Buddha statues left inside by pilgrims traveling down one of these famous rivers in time past. 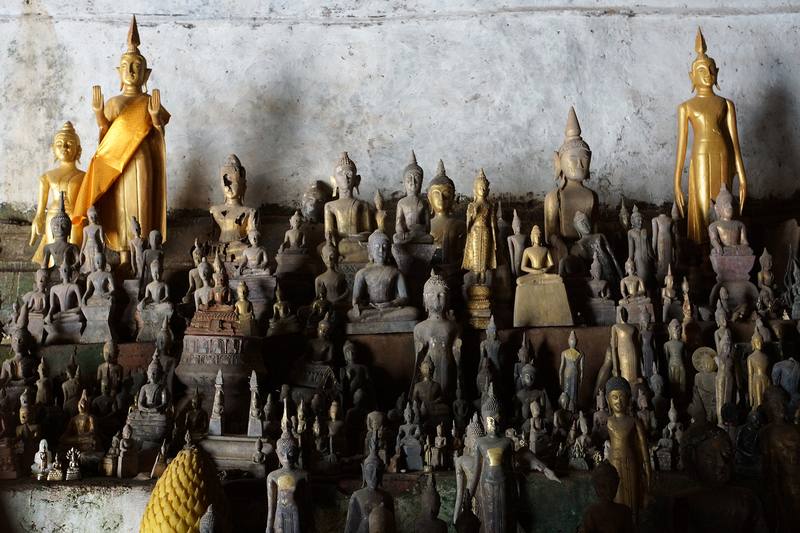 Never have we seen so many Buddha statues! 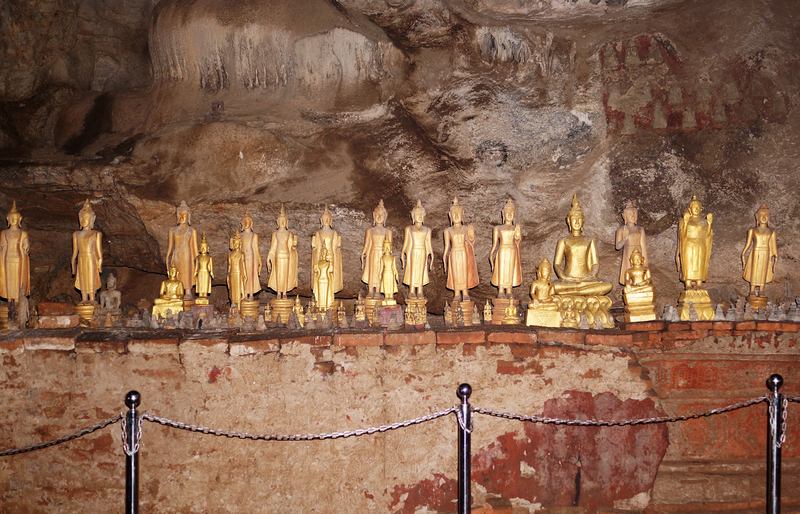 Amazing how many Buddha have been placed in the cave over the years. Much merit gained by donaters! 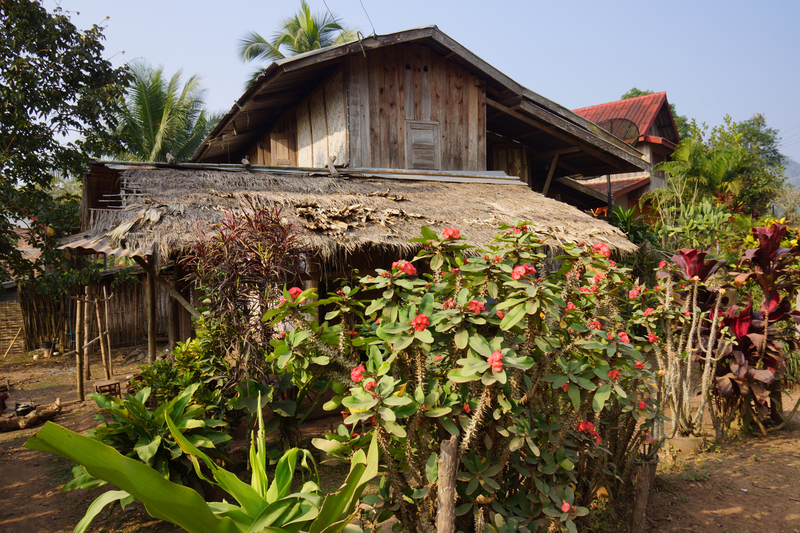 Along the Mekong River: we made several interesting stops at different villages along the way. Each seemed to have a unique craft or specialty to offer. 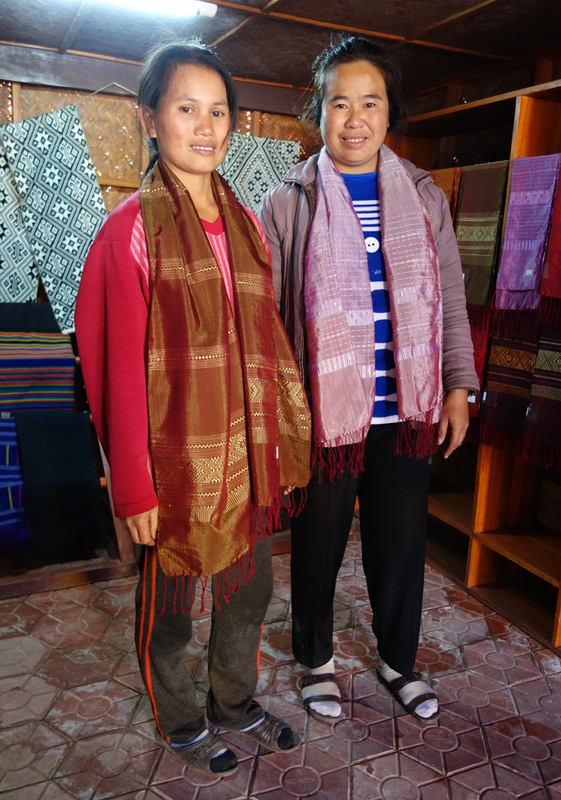 We visited a woman who had created a weaving cooperative Local women would weave scarves, skirts, towels and other items at her weaving center. She was quite entrepreneurial and had built a fairly large operation. She is able to fill many large orders from local hotels and restaurants. the only way to reach the weaving village. no cars here. 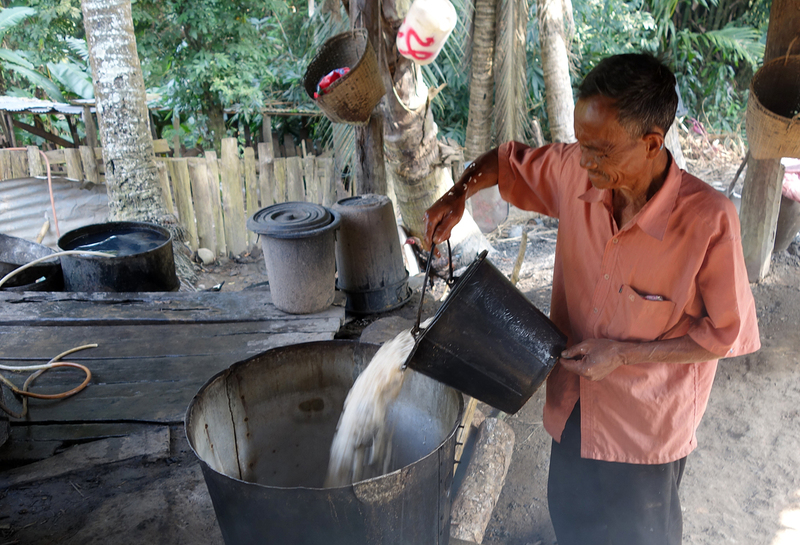 This local “Lao-Lao Whiskey” producer had once been a farmer and had turned to whiskey production as an added source of income. He and his wife gave us a step by step demonstration of the process. 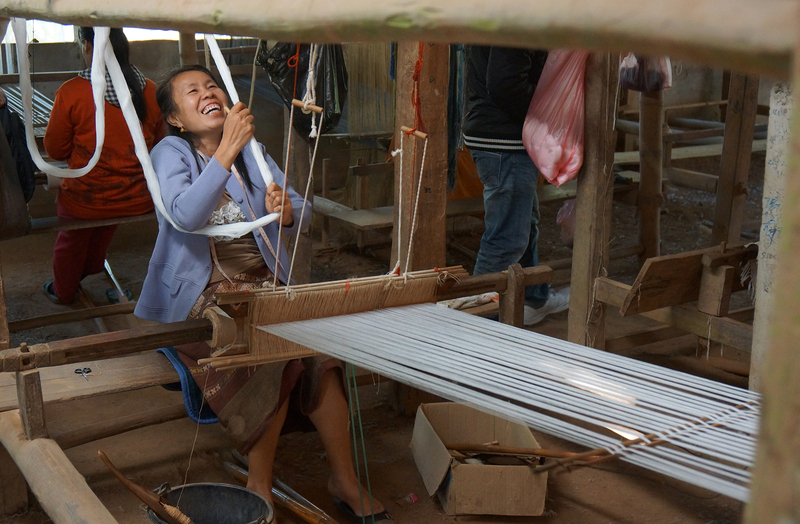 This village now makes their living primarily from whiskey, weaving, and other small handicrafts they are able to sell to any passing tourists on the river that stop by. 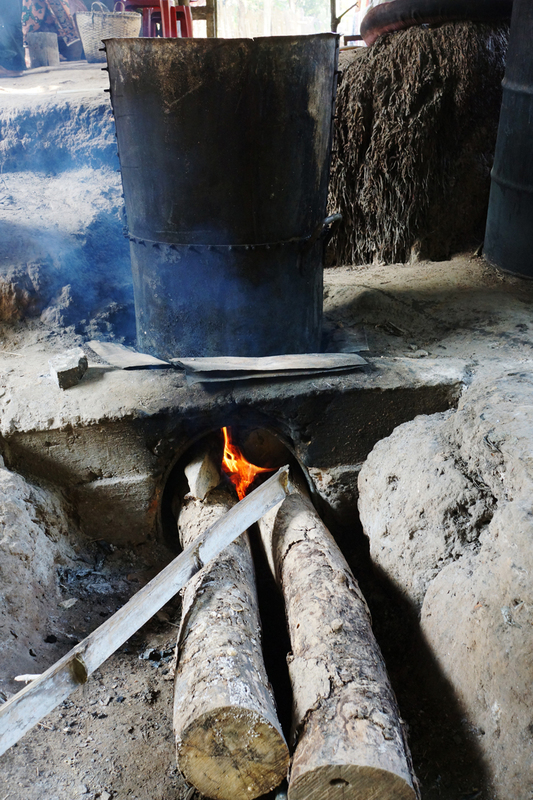 I should mention here, “lao-lao” is POTENT! 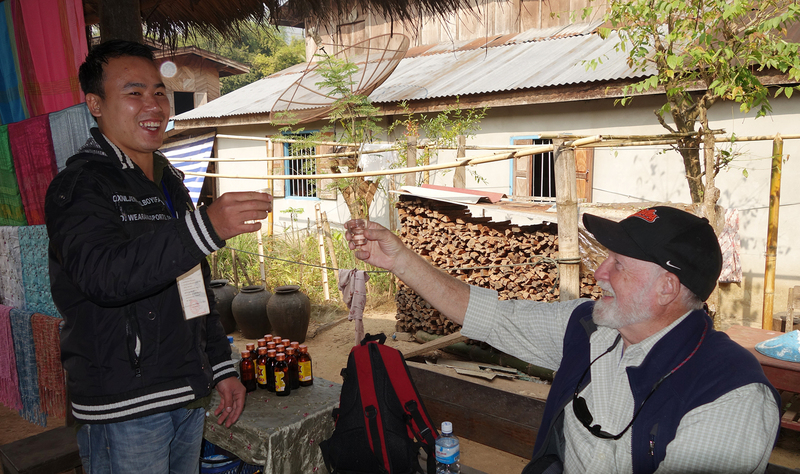 Depending on which village and which whiskey-crafter you encounter, the alcohol percentage can range from 40% to 75%. 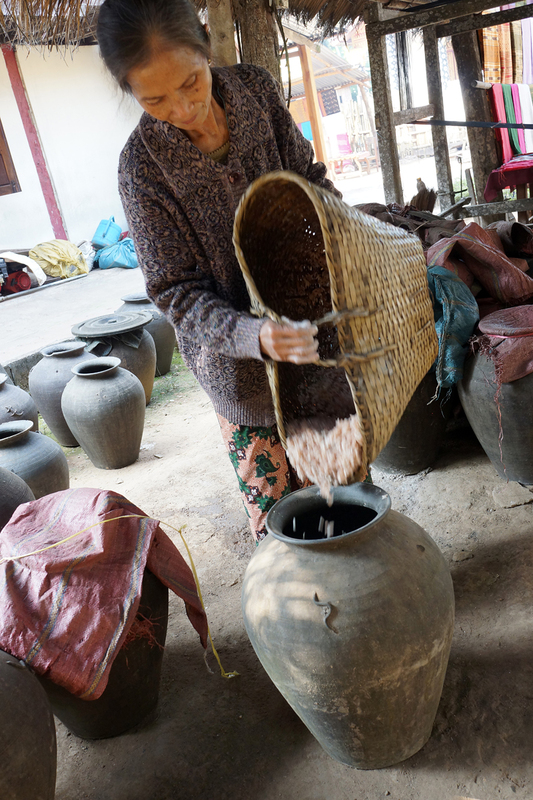 This villagers’ product was somewhere around 60-65%; and proud of it! 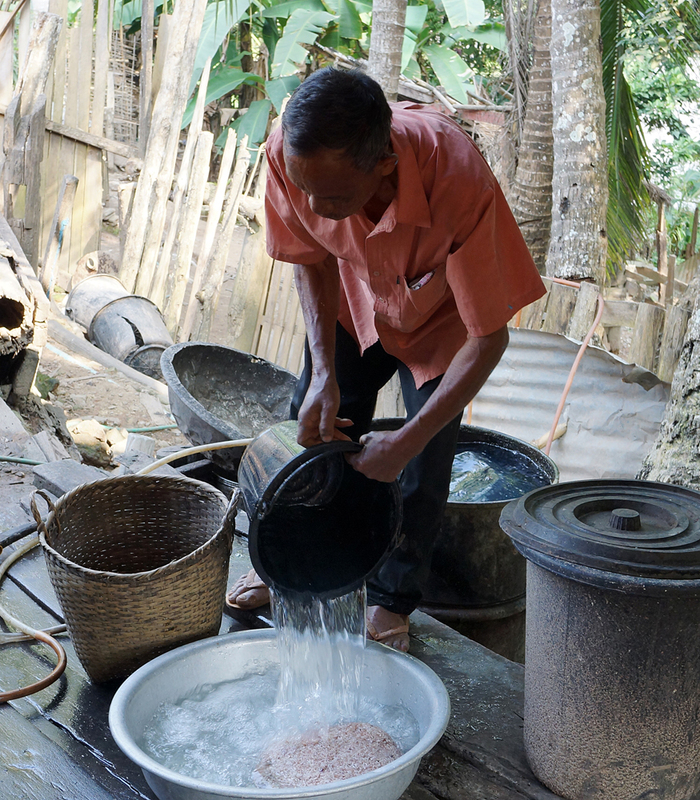 Shaking and separating the wet rice. readying the mix for the fire pot. Would she like a small sticker? UnHuh. “Baci” is an animist ritual that celebrates a special event or occasion , such as marriage, a homecoming, a travel blessing, a birth in the family, or one of the many annual festivals. 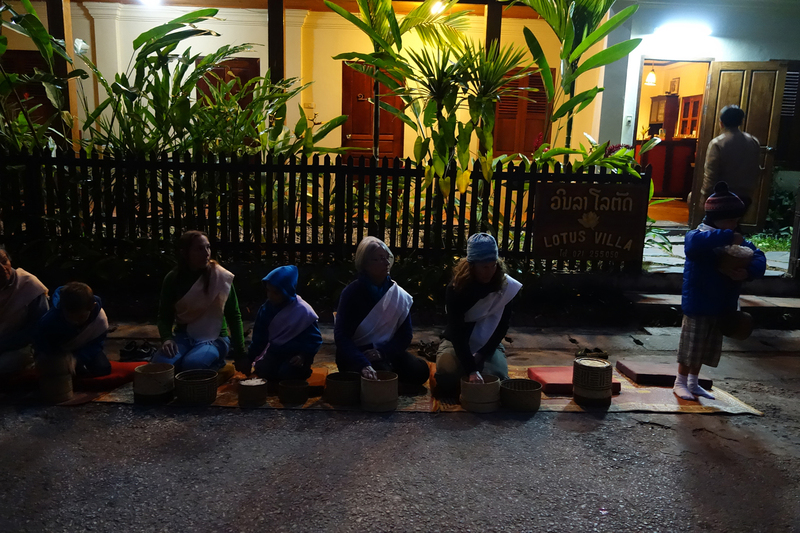 It is a very old tradition: practiced in Laos long before Buddhism made inroads into the country. 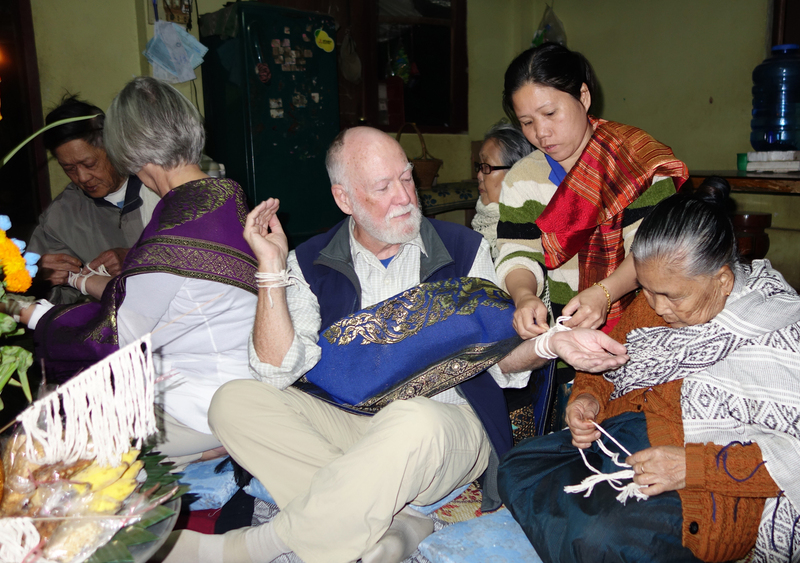 We were invited to participate in a baci ceremony, referred to as su kwan, which means “a calling of the soul”. It was performed by a local village elder and a number of his villagers. We didn’t know what to expect and were very surprised that the ceremony was intended just for us. 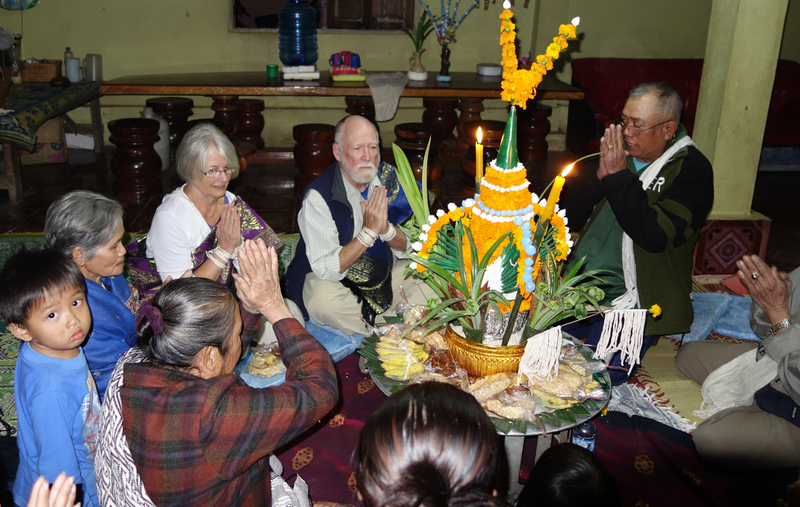 In the middle of the room was the pha kwan, an intricate arrangement consisting of a dish, from the top of which sprouts a cone made of banana leaves, flowers, and white cotton threads. The cotton threads are cut at a length long enough to wrap around the your wrist. 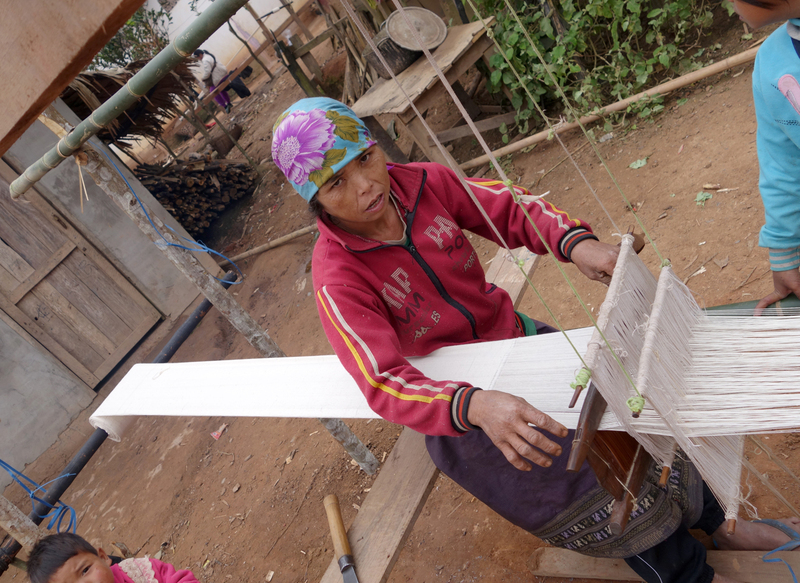 These are attached to a bamboo stalk and give the impression of a banner. Food is placed around the base of kwan. 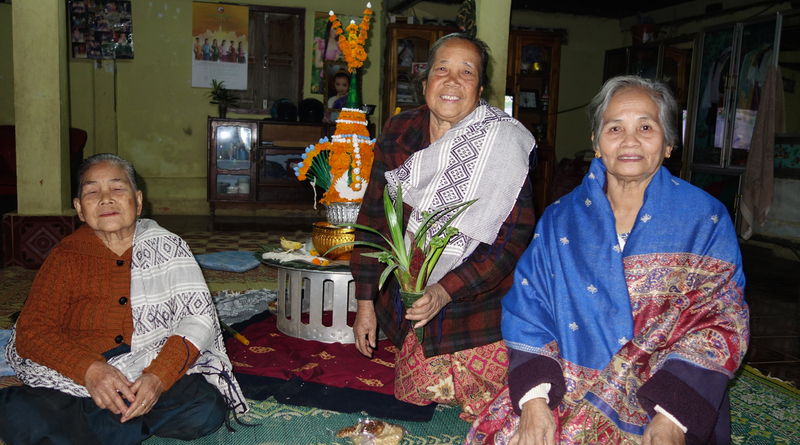 The Lao believe that this blessing will bring the believed 32 khans (souls) that watch over you, back to your body so that you may be blessed and kept healthy. 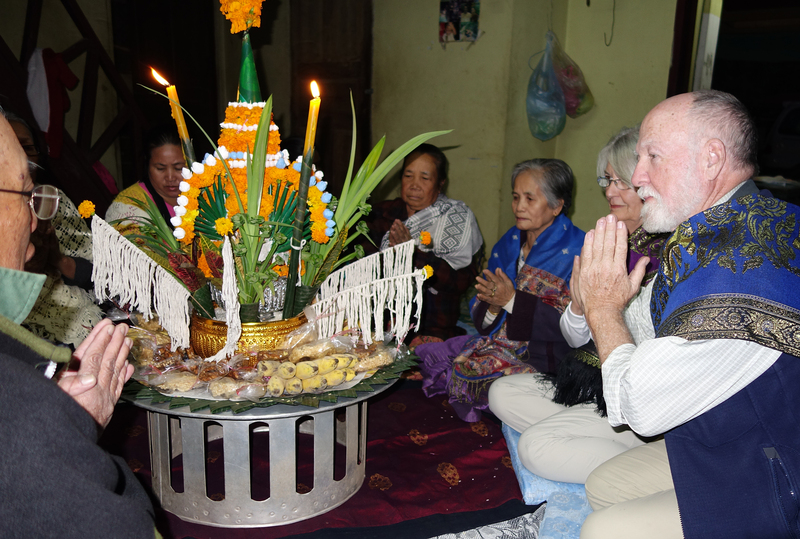 There was a lot of chanting, blessings and pook kwan (the tying of the white baci threads on each of our wrists) from the villagers. 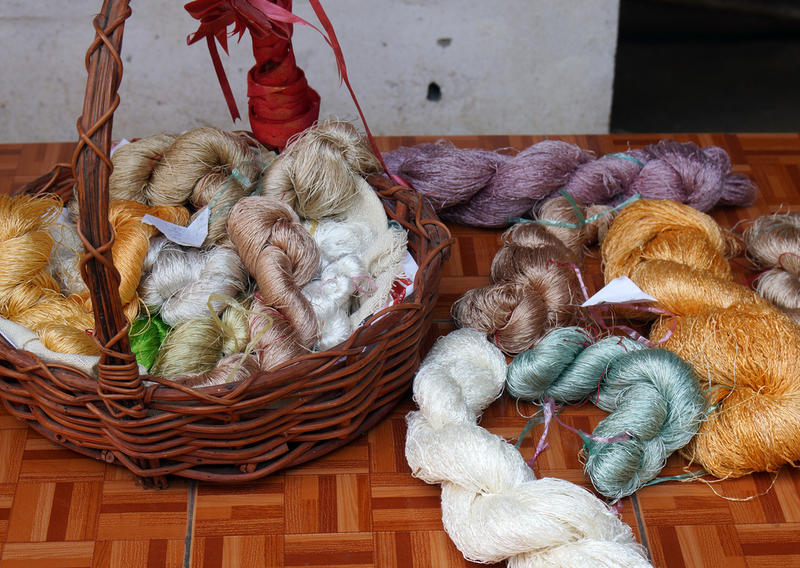 The white cotton thread is a symbol of peace, good fortune, honesty and comfort. They are traditionally worn for at least 3 days following the ceremony, and it is bad luck to take them off before then! This was a most interesting evening for us. 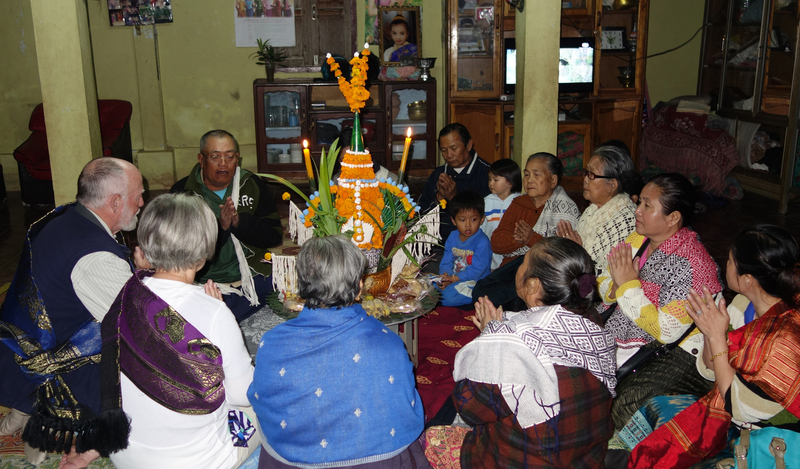 The contrast of the traditional ceremony being performed while a flat-screen television was on the whole time in the background, with several other children watching cartoons, made it seem surreal. 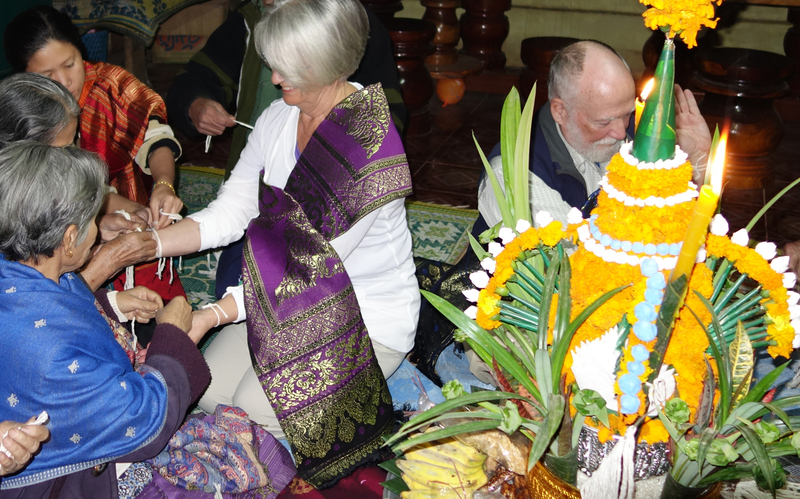 We did receive many positive comments from local Laotians over the next few days as they recognized the strings around our wrists and that we had participated in a baci blessing. They seemed pleased that we had taken part in something that represents an important tradition for them. One young man was a new father and had strings on his wrists from a similar blessing. 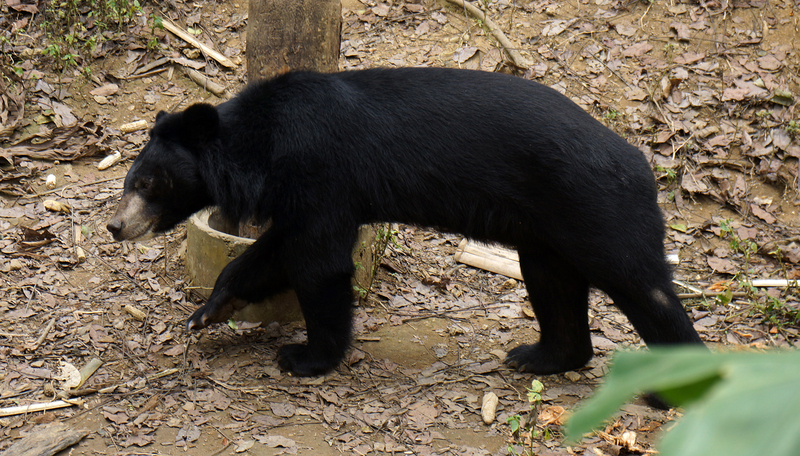 He stopped to thank us for our interest in all things Lao. Each would say a blessing as they tied them. 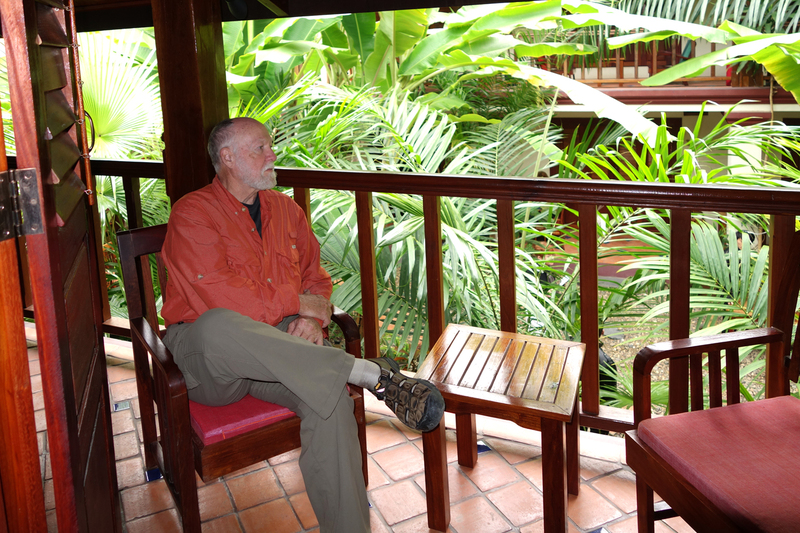 Later that evening back in our villa, we counted them: sure enough – – there were exactly 32 on them! These ladies created the centerpiece and the food — they insisted we take all the food! They were delightful. 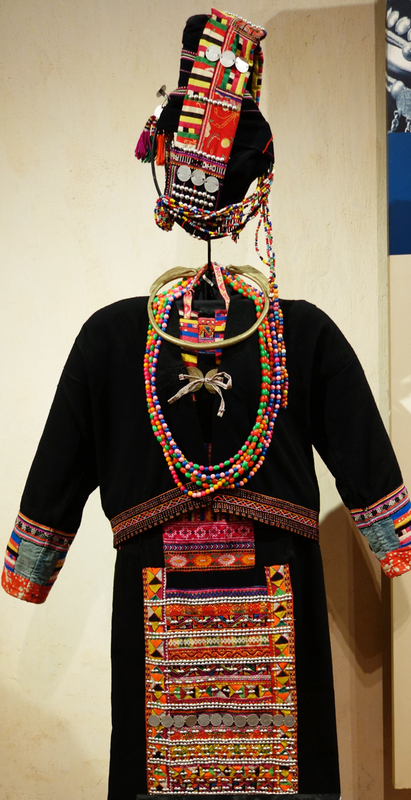 The Ethnology Museum of Luang Prabang was a great place to experience the different traditional dress styles for many of the minority groups living up north here in the mountains region of the country. 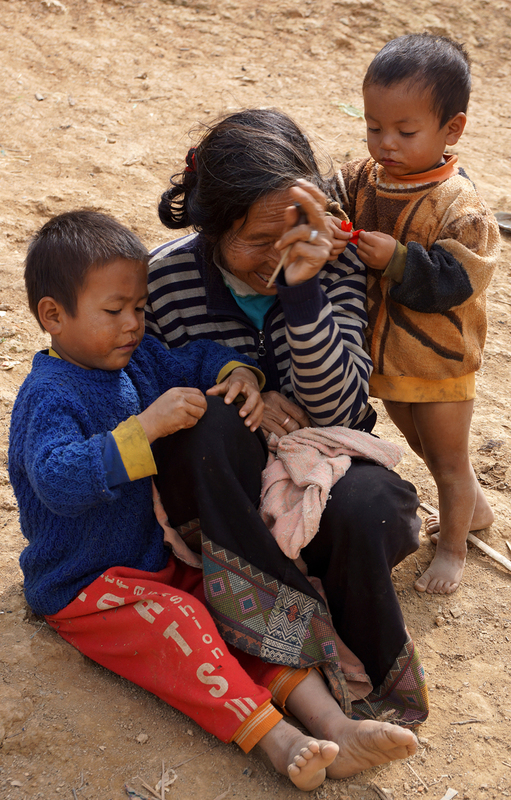 The villagers usually wear western style clothes now (they can buy them so cheap imported from China) and wear their traditions clothes only for celebrations. 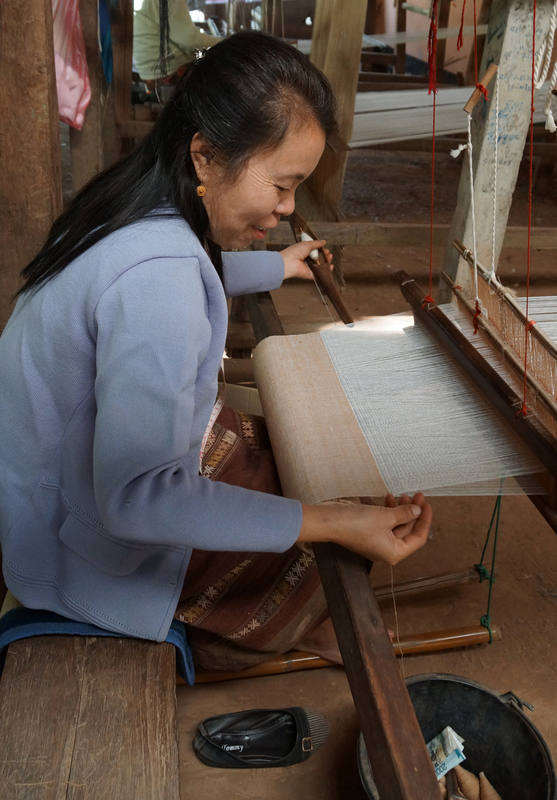 Weaving used to be practiced primarily out of necessity back in the day, and now is done only to make special traditional clothes and for selling some to tourists. 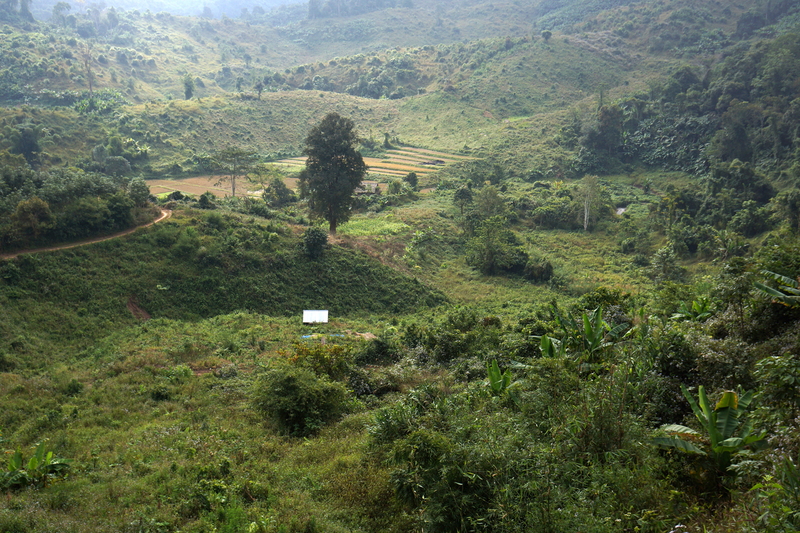 The Kmhmu are the second-largest ethnic group in Laos, whose ancestors are considered to be the original inhabitants of the country. 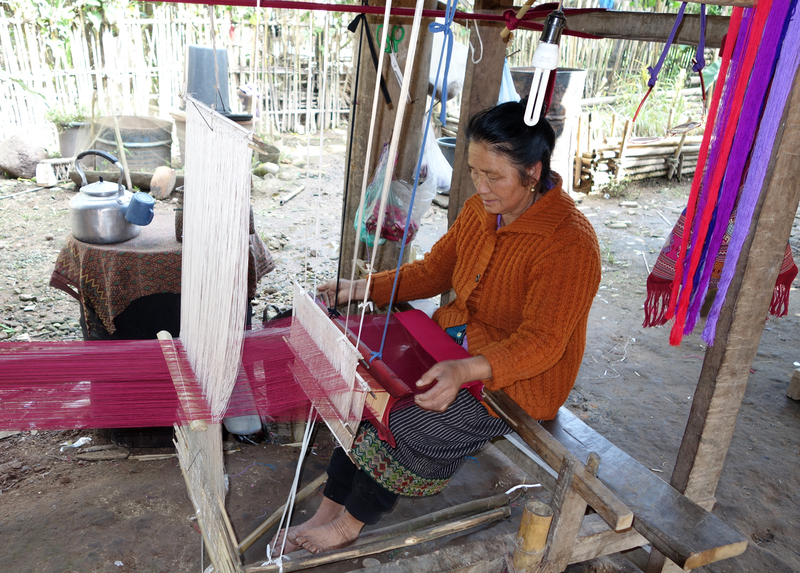 This village stopped weaving 25 years ago when they moved closer to a town, where they could buy cheaper clothing. 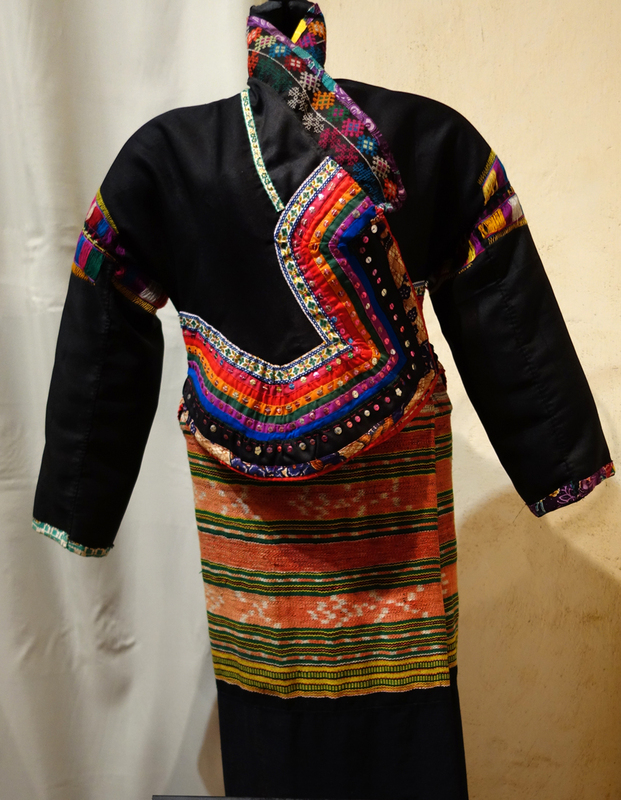 Hmong – one of Laos’ most famous S.E.Asia ethnic groups, with a large overseas diaspora, particularly in the United States. 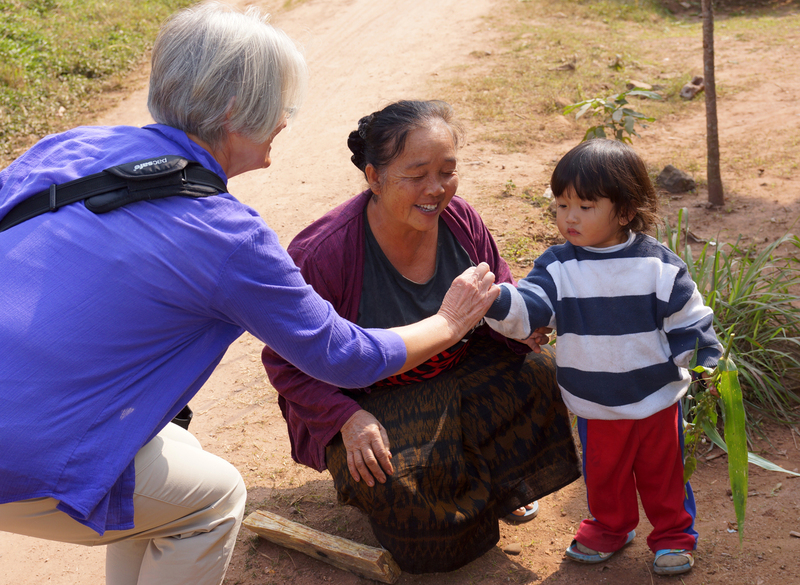 We often met Hmong in our travels who had family in Oregon, California, or Minnesota! 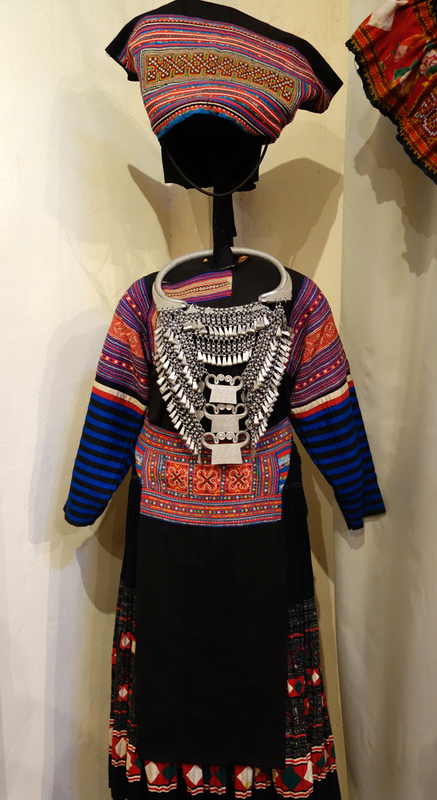 Luma – a small ethnic sub-group, but with very distinctive dress. 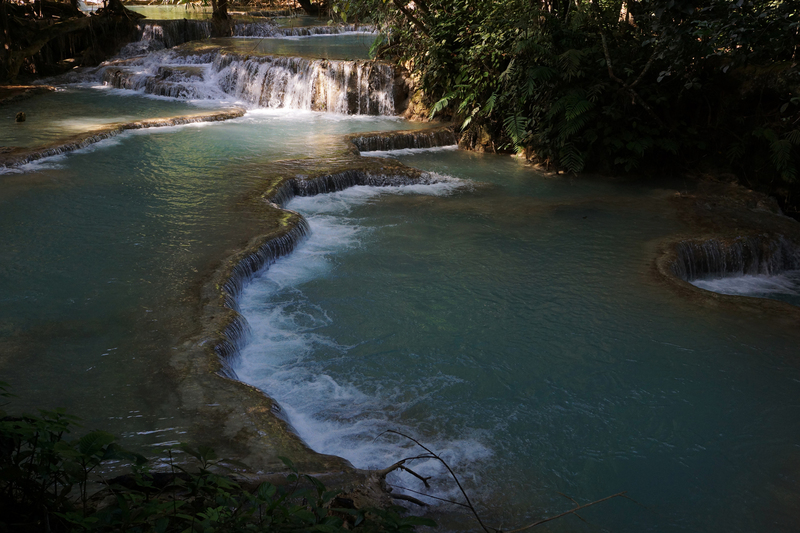 We took an excursion to a waterfall about 20 km south of Luang Prabang. It was truly worth the experience. If it had been warmer we might have taken a plunge or two into these beautiful pools, but were quite content to walk among them. 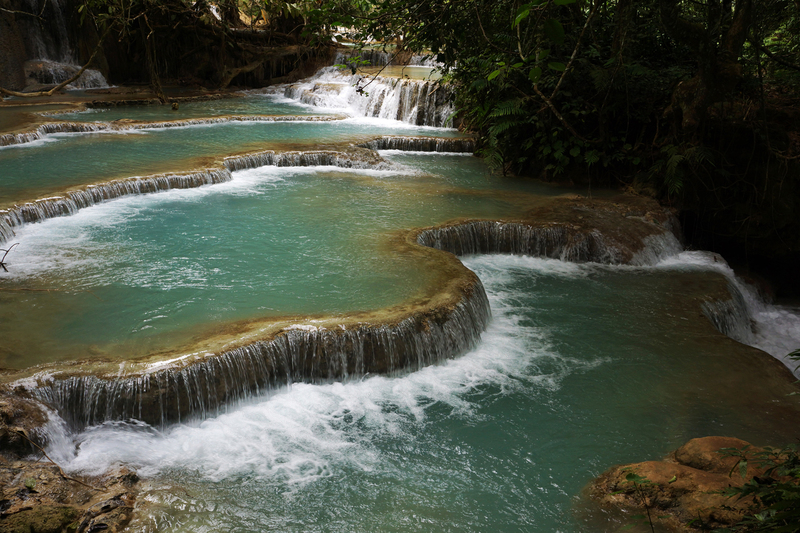 The falls coming over the canyon wall in a 200 foot cascade, traversed a series of stunning turquoise-blue pools. 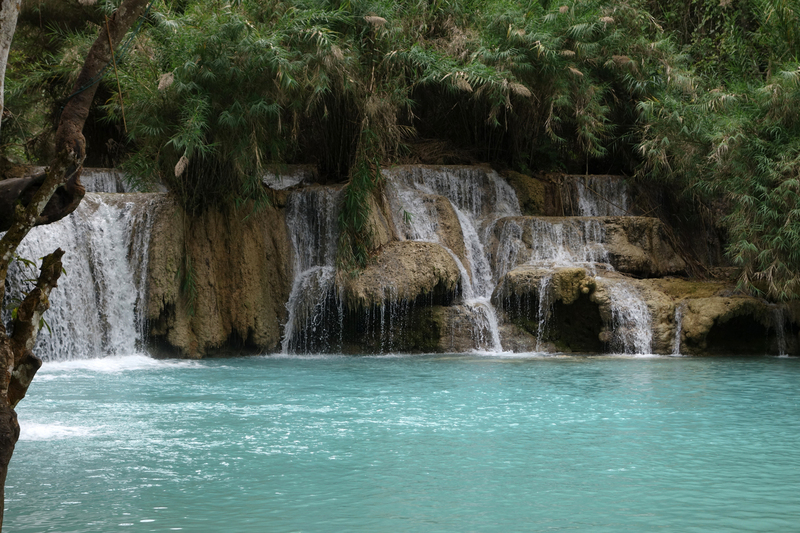 These falls are typical of travertine waterfalls (a form of limestone deposited by mineral water or hot springs). 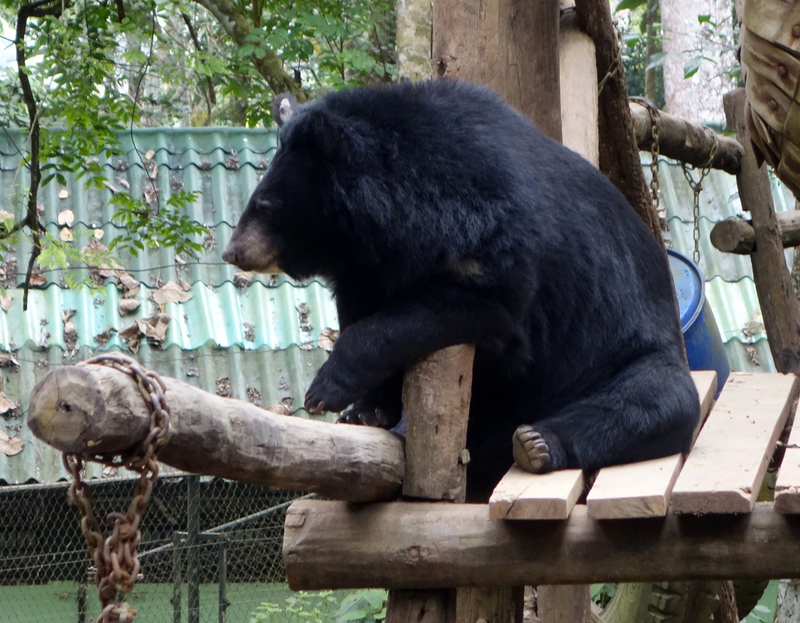 The park-like area had a center for the rehabilitation of native animals, and we were able to view Asian Black Bears that had either been rescued from the wild. 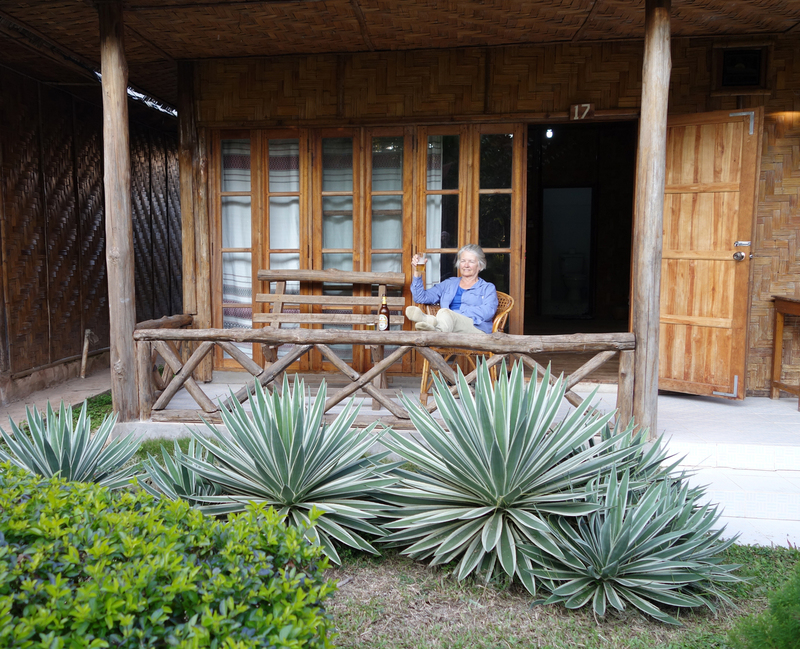 The center is well done and the animals are very well cared-for. Our guide for the day had even packed a delicious lunch for us, and we sat by the waterfalls and the pools enjoying the ambience and tranquility of the moment. 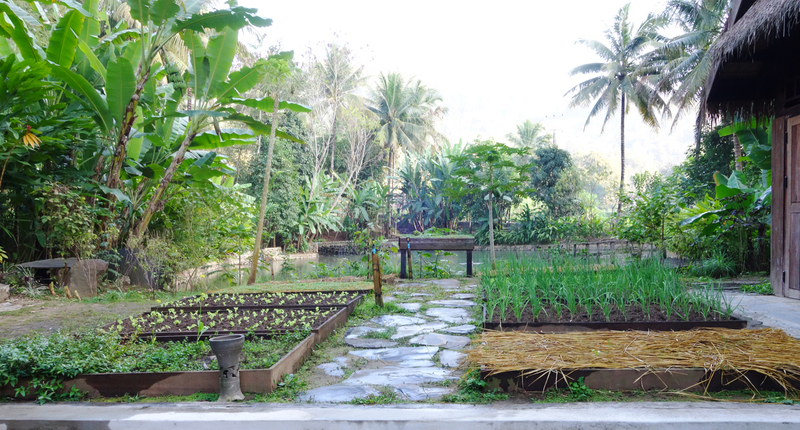 Beautiful gardens in the valley on the way to the falls. 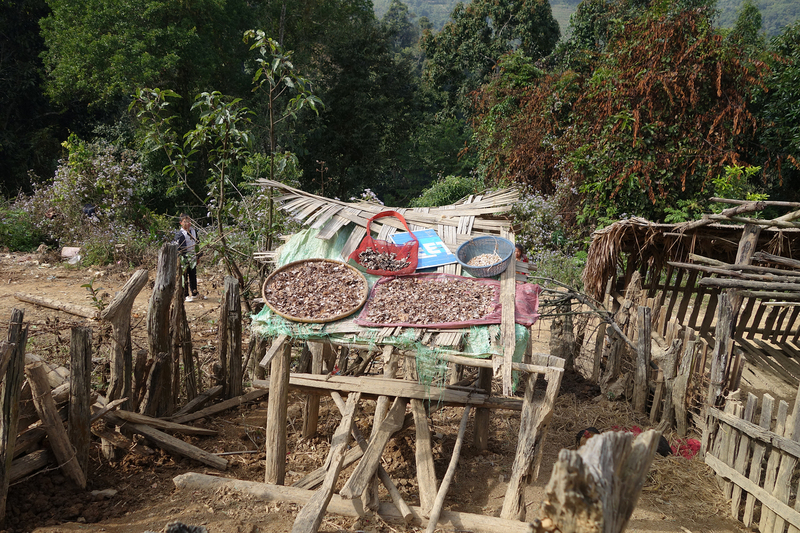 Lao people are great farmers, and the local produce is some of the best we tasted on this journey. 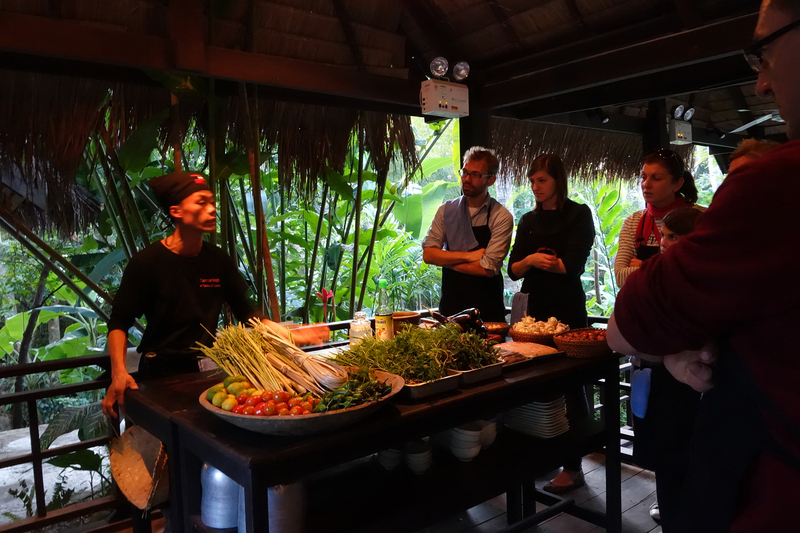 A highlight for Evie was attending a very special cooking class — anyone want a traditional Laotian dinner with us when we get back?? 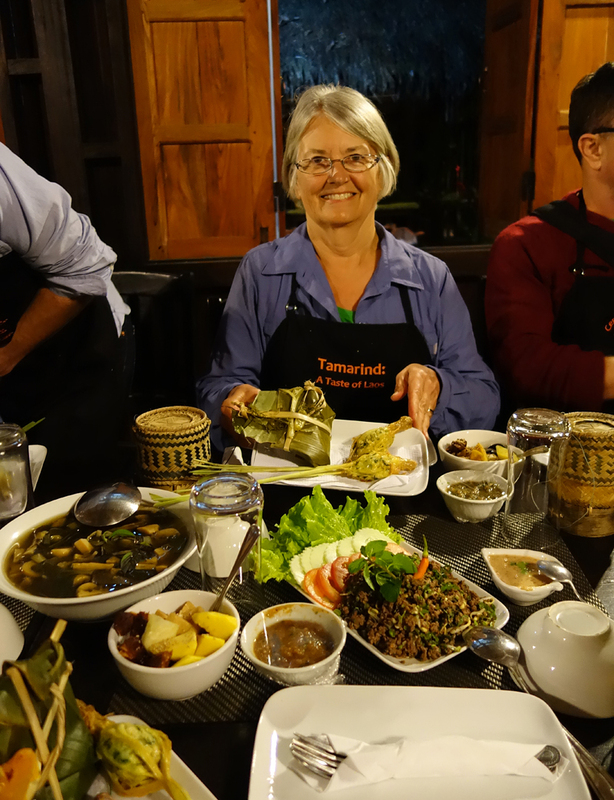 We have immensly enjoyed Laotian food while here, which has been regarded as similar to Thai, but we had been told not as ‘spicey’. That depends on where you get it! 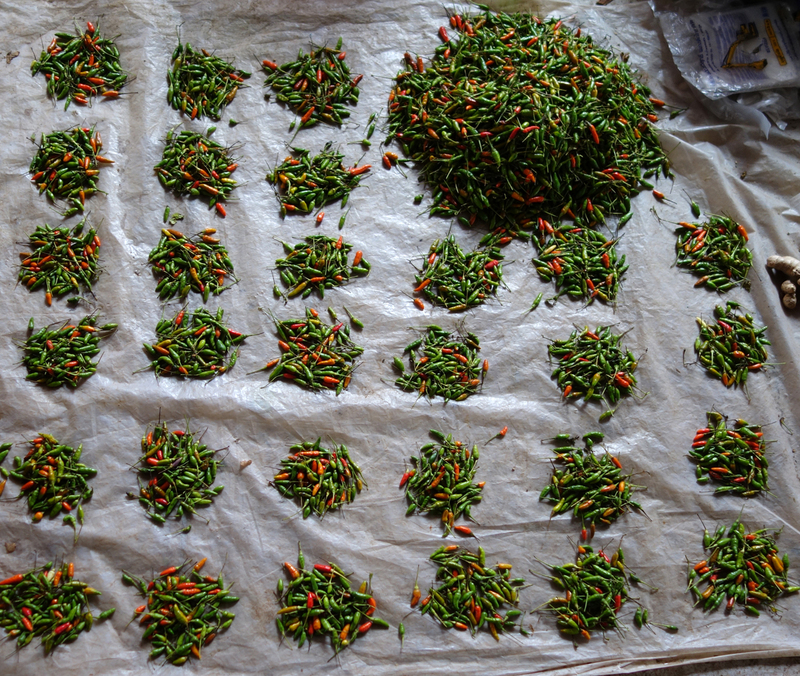 Rather than mix these delicious chilies, coriander, etc. in with the dishes they prepare (think varieties of curry), they are always available as sauces you can add yourself. Thus, the spice is up to you! 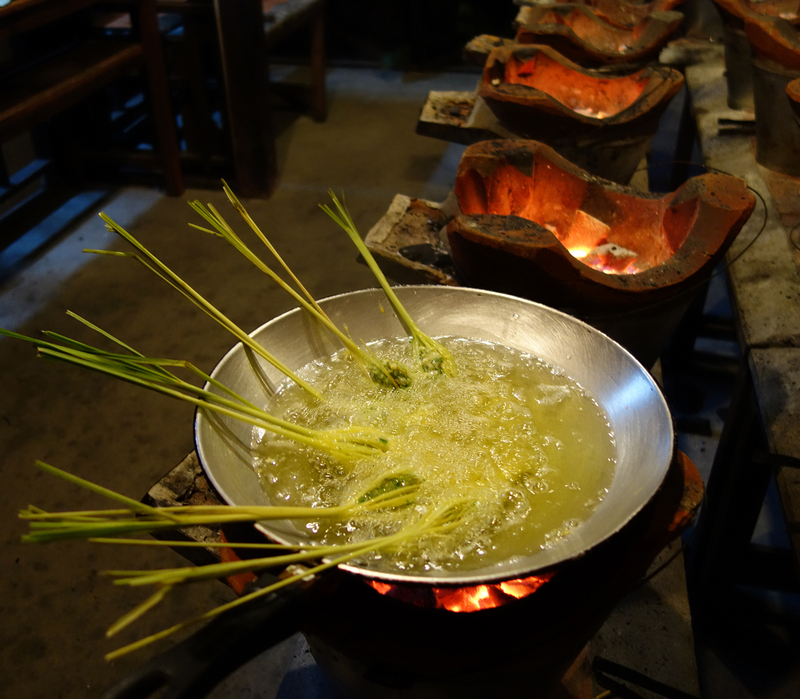 One of the big differences is that Lao food uses sticky rice instead of jasmine or basalmic! 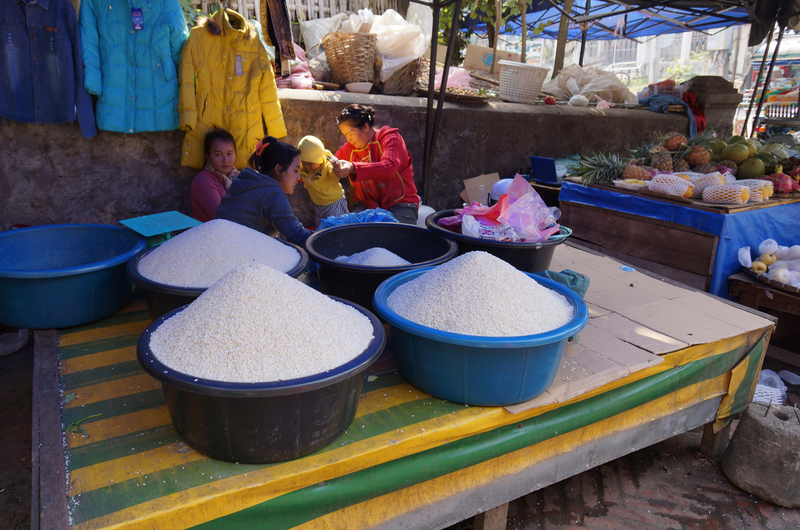 It’s the staple and is eaten with the fingers; all northern Lao dishes are designed to accompany it. 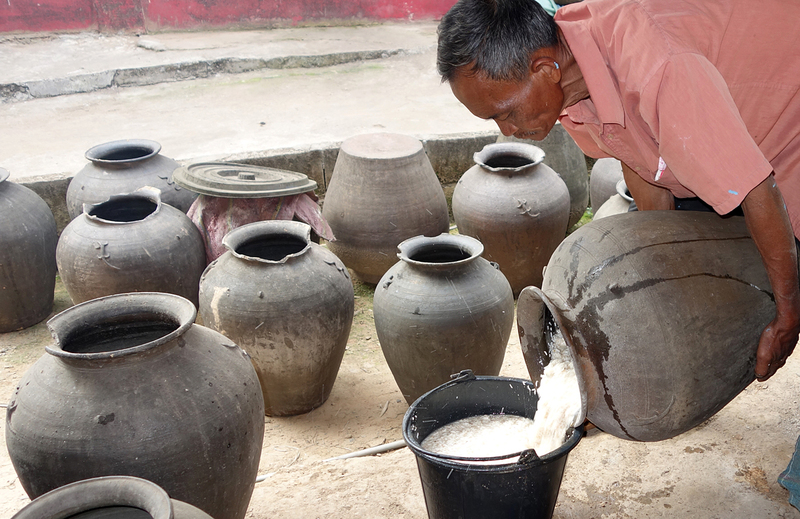 They like strong favors and use bitter, salty, spicy, and sour favors to balance the bland rice. In fact all of their dishes seem to be an intricate balance of these yin and yang principles. Food is eaten communal-style with spoons, or more often, fingers. Chopsticks are only for noodles. 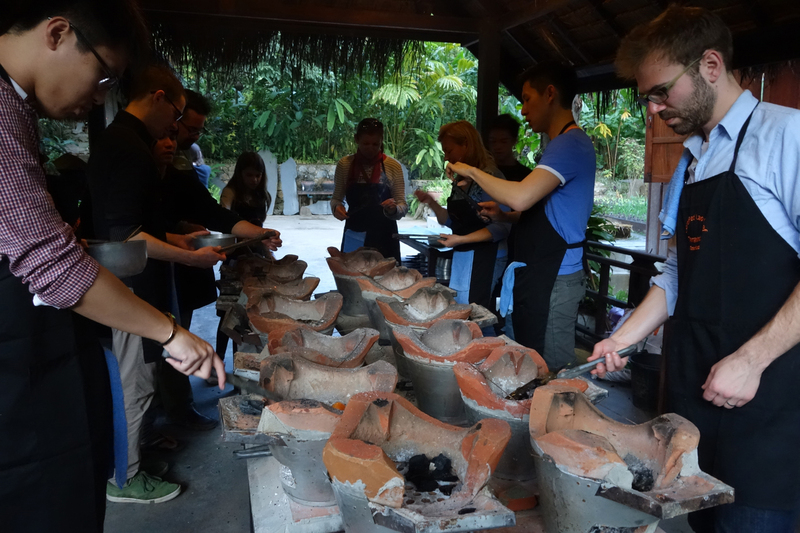 A lot of the preparations use a deep mortar and pestle to release flavors of fresh herbs, chilies, etc. 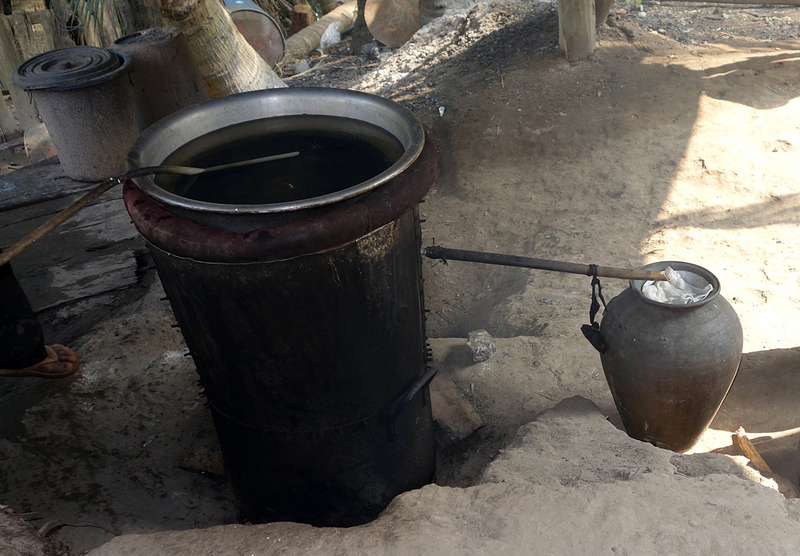 Cooking is all done over a clay and tin brazier. 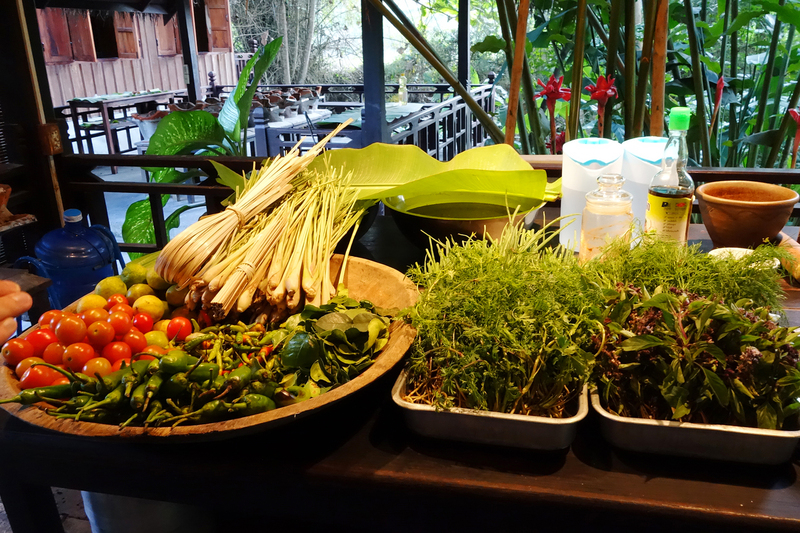 Anyone ready for stuffed lemongrass, fish steamed in banana leaves, green papaya salad, sticky rice with several different jeow (spicy dips made with chillies & tomatoes or a smoky eggplant)? I am hoping I can find all the ingredients or substitutes to make these dishes back in Portland. Luckily, we are endowed with many asian food stores in our hometown. 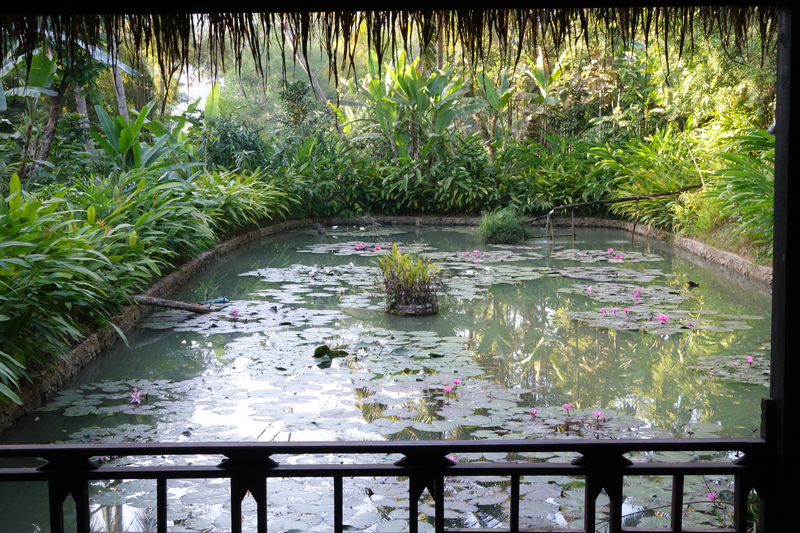 Ponds on both sides. Did they get there fish here as well as in the Mekong? 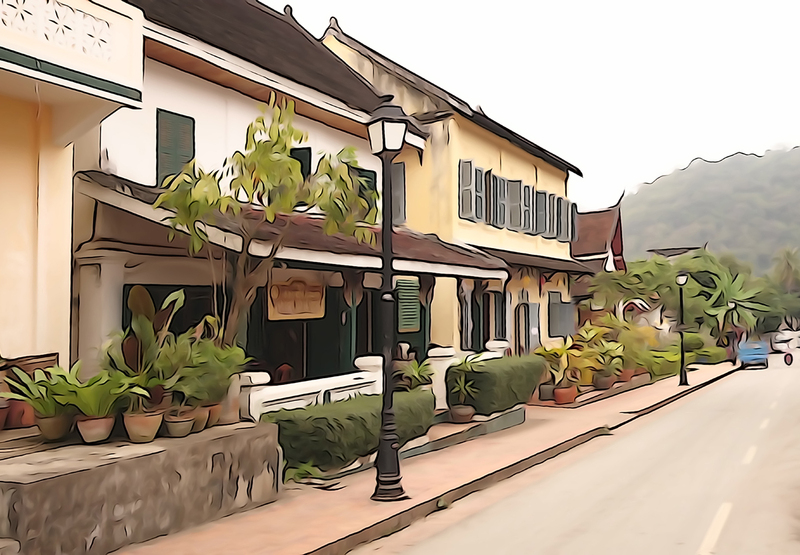 here are some parting images that Gary played around with to give a more artsy look to Luang Prabang. See what you think of them. He particularly liked the way the town began to resemble a small city maybe in southern France . 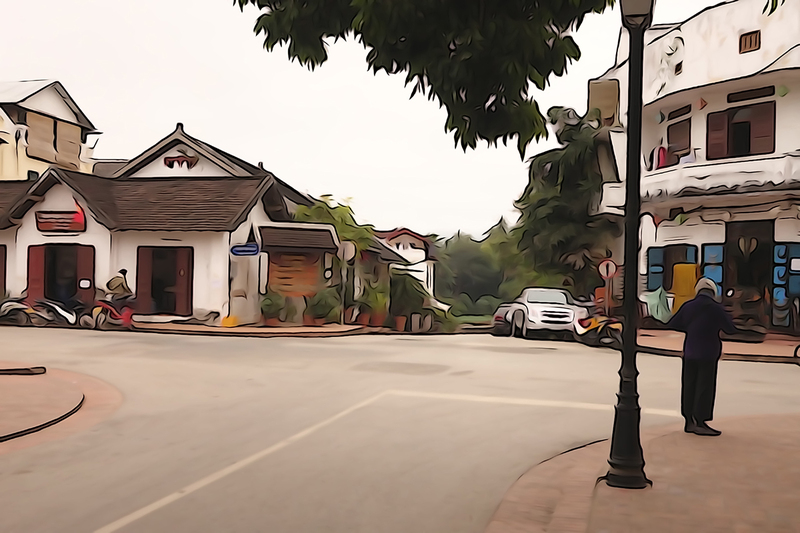 . .
we fell in love with Luang Prabang!